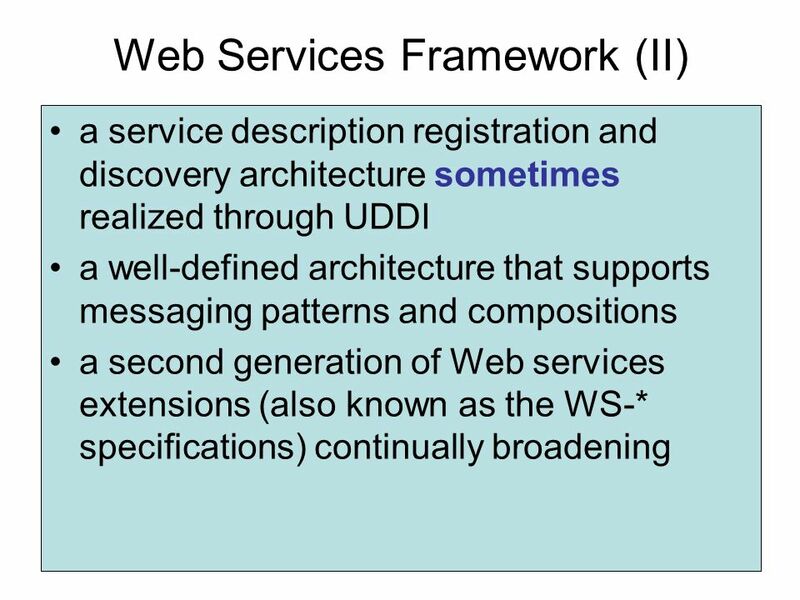 There are many things that might be called "Web services" in the world at large. 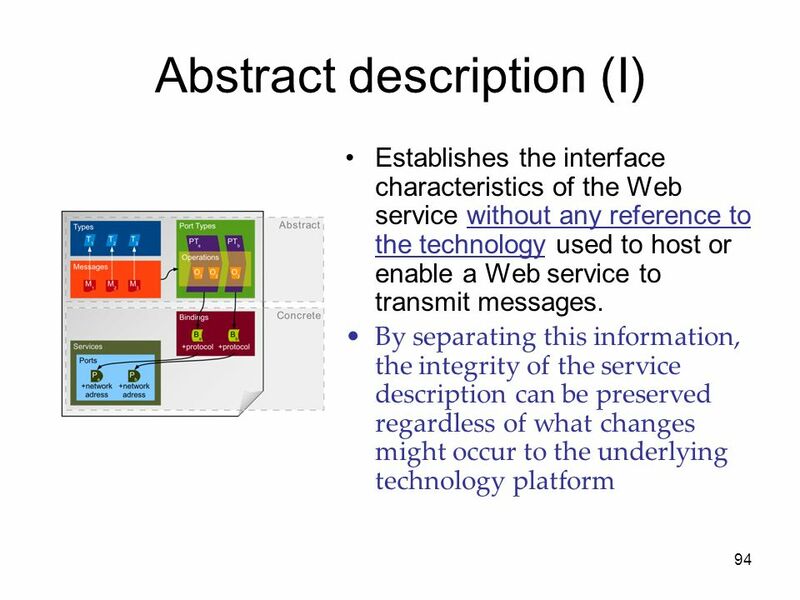 However, for the purpose of this Working Group and this architecture, and without prejudice toward other definitions, we will use the following definition: A Web service is a software system designed to support interoperable machine-to-machine interaction over a network. 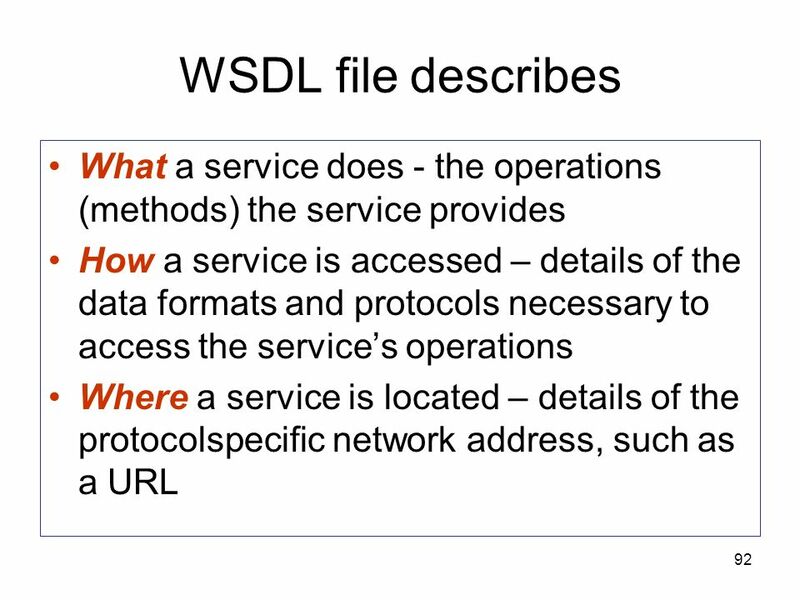 It has an interface described in a machine-processable format (specifically WSDL). 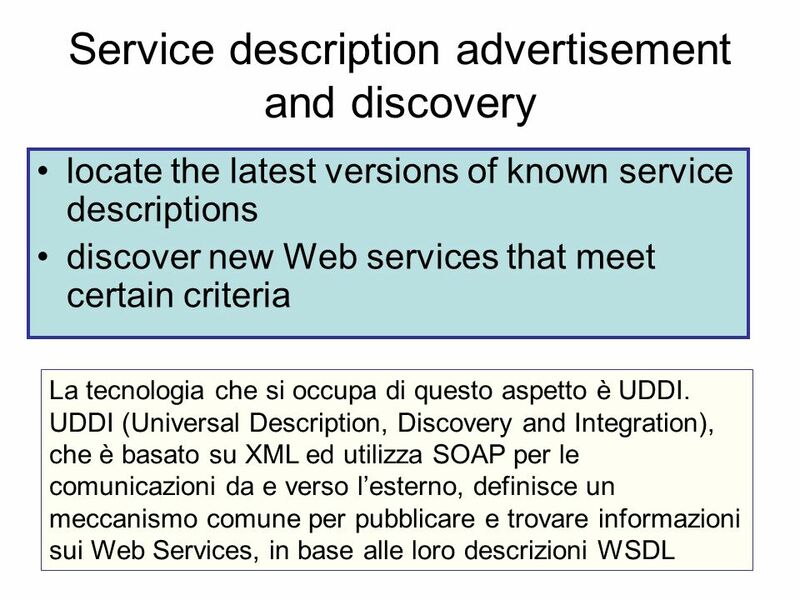 Other systems interact with the Web service in a manner prescribed by its description using SOAP-messages, typically conveyed using HTTP with an XML serialization in conjunction with other Web-related standards. 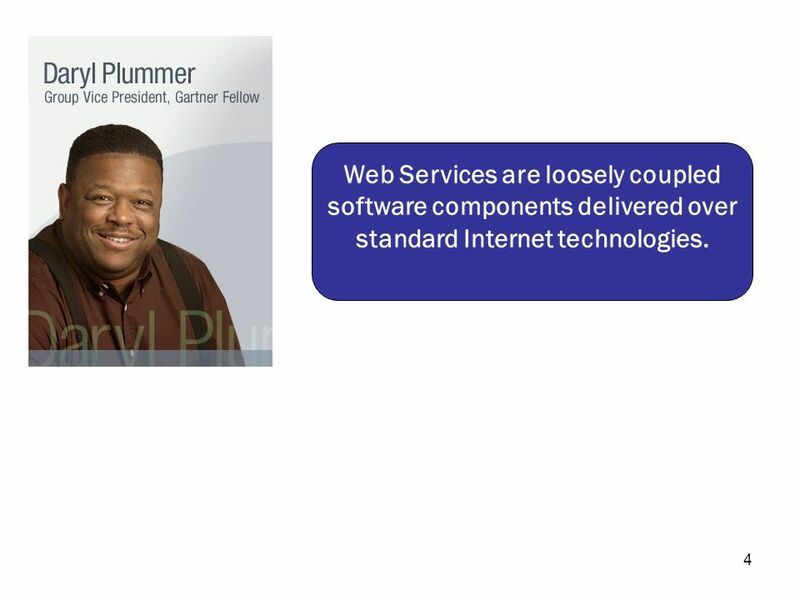 4 Web Services are loosely coupled software components delivered over standard Internet technologies. 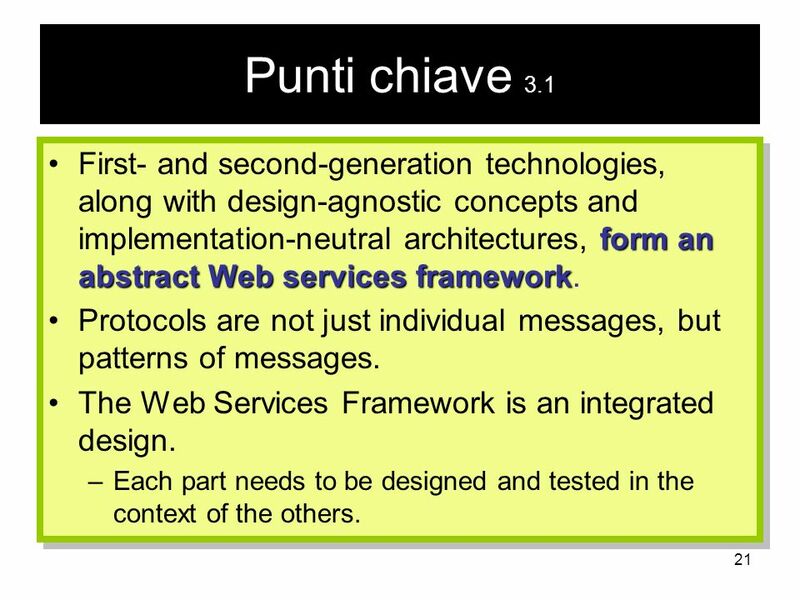 21 Punti chiave 3.1 First- and second-generation technologies, along with design-agnostic concepts and implementation-neutral architectures, form an abstract Web services framework. 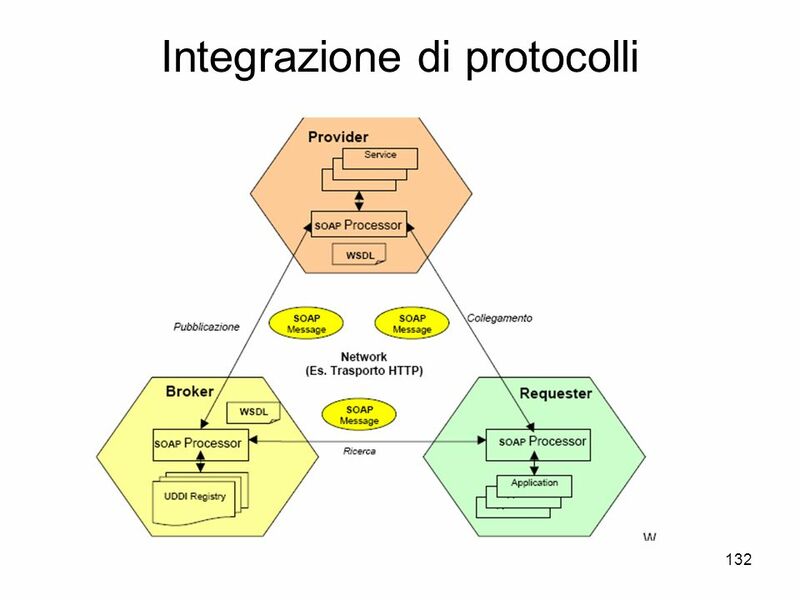 Protocols are not just individual messages, but patterns of messages. 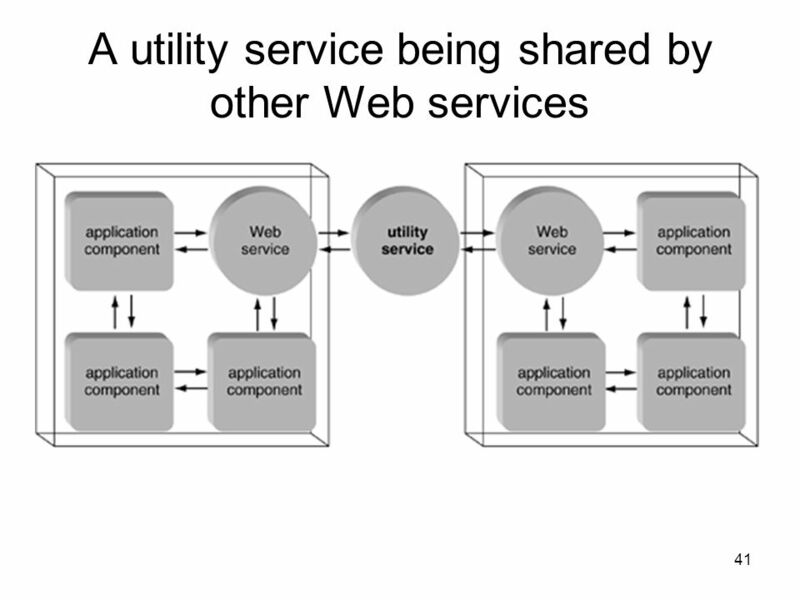 The Web Services Framework is an integrated design. 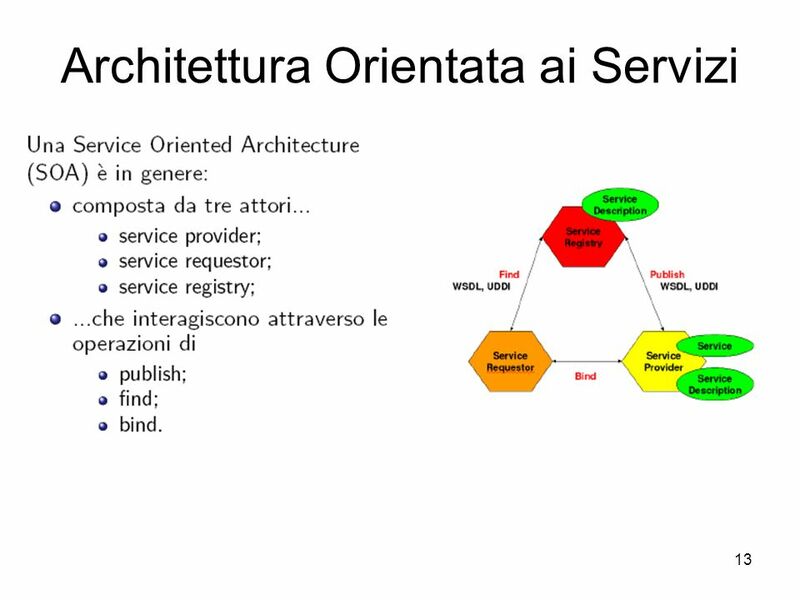 Each part needs to be designed and tested in the context of the others. 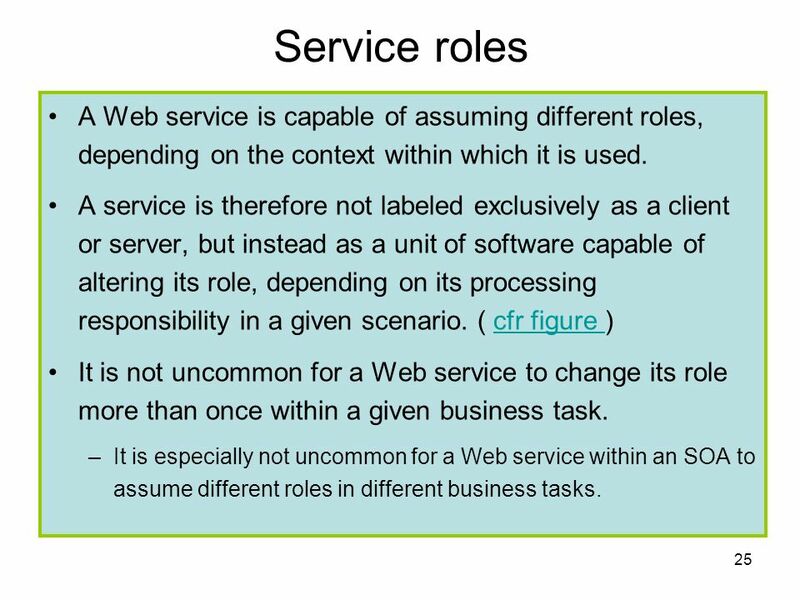 25 Service roles A Web service is capable of assuming different roles, depending on the context within which it is used. 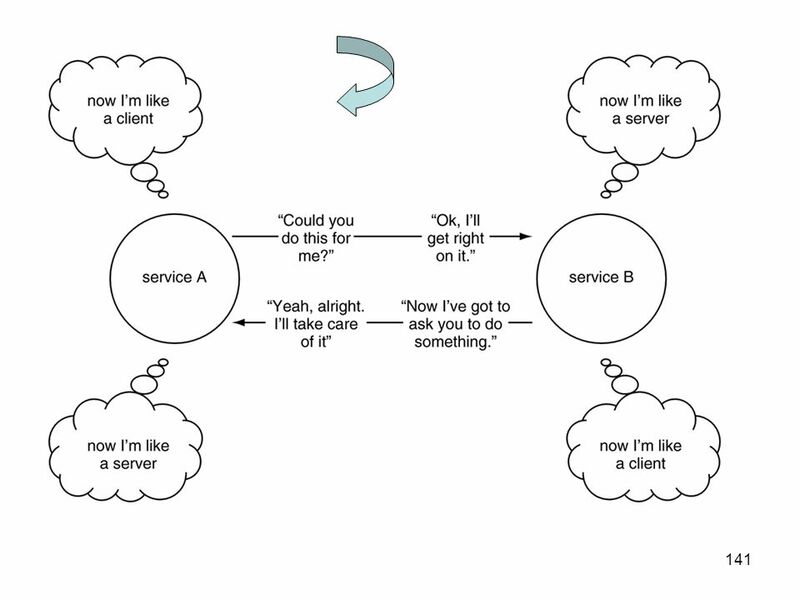 A service is therefore not labeled exclusively as a client or server, but instead as a unit of software capable of altering its role, depending on its processing responsibility in a given scenario. 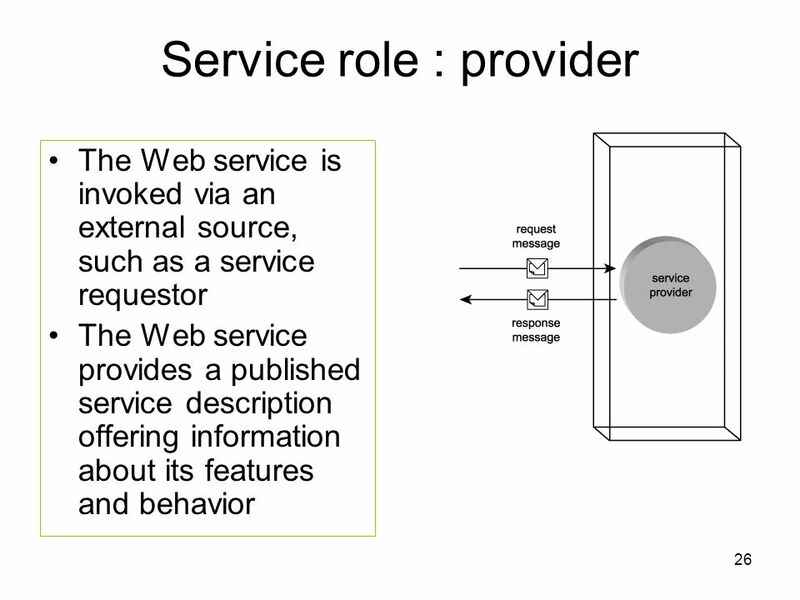 ( cfr figure ) It is not uncommon for a Web service to change its role more than once within a given business task. 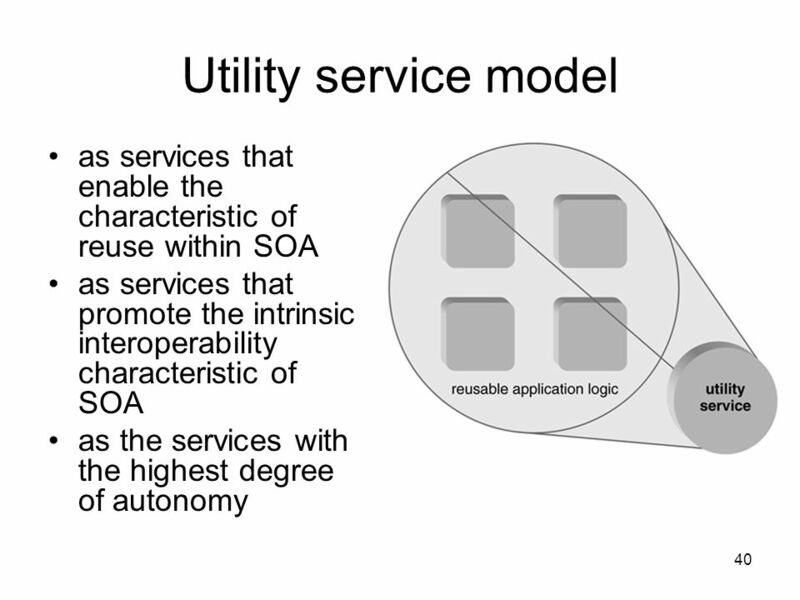 It is especially not uncommon for a Web service within an SOA to assume different roles in different business tasks. 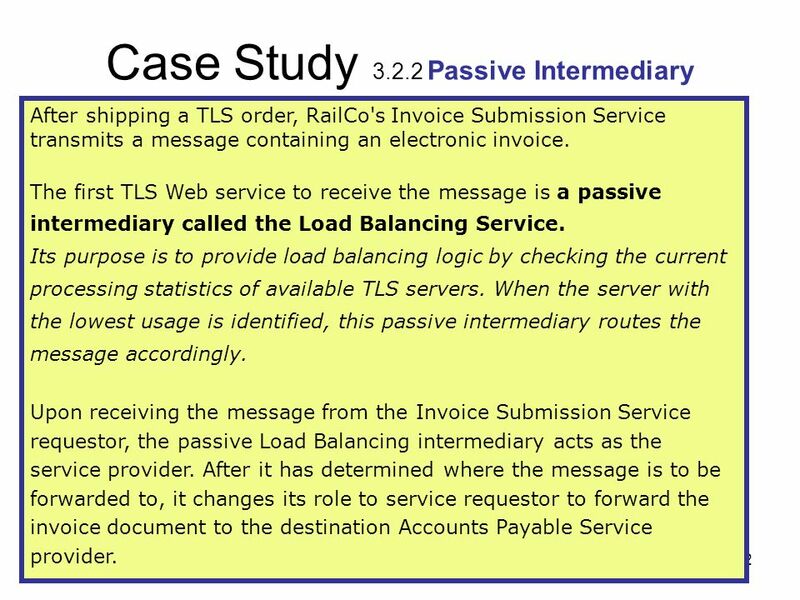 After shipping a TLS order, RailCo's Invoice Submission Service transmits a message containing an electronic invoice. 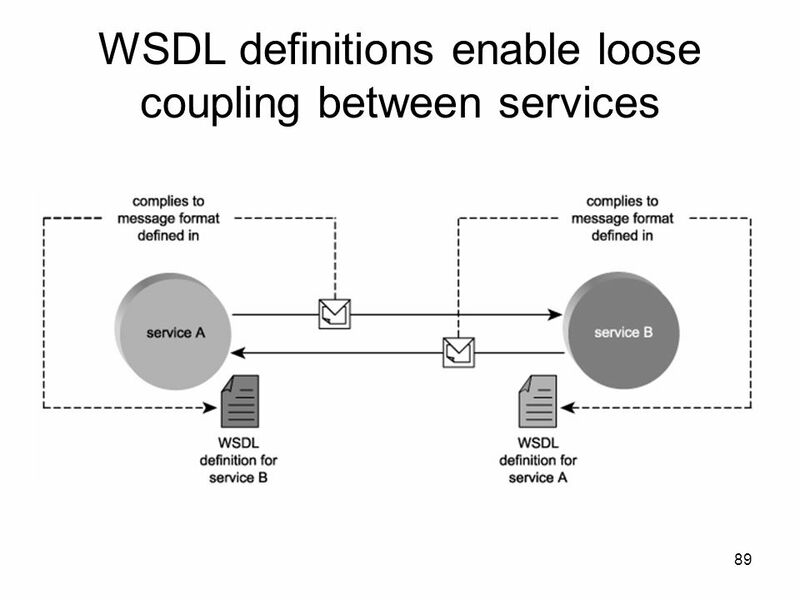 The first TLS Web service to receive the message is a passive intermediary called the Load Balancing Service. 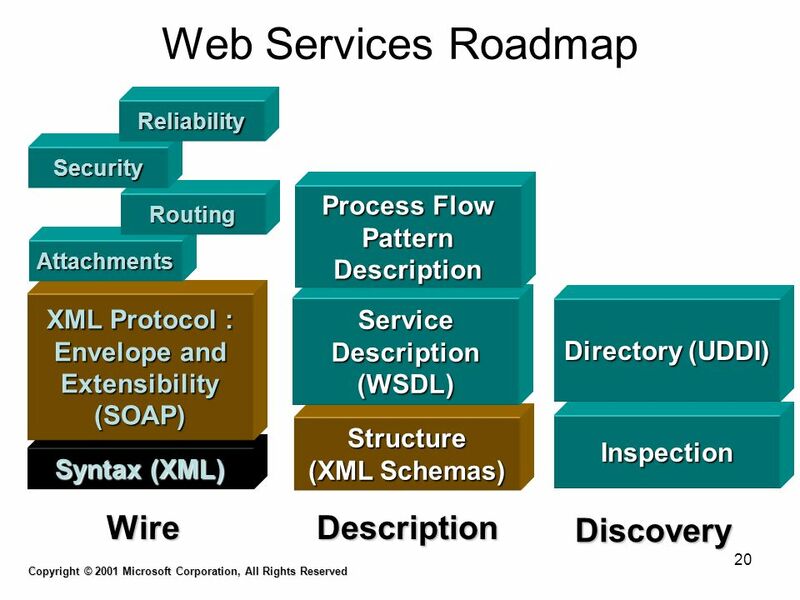 Its purpose is to provide load balancing logic by checking the current processing statistics of available TLS servers. 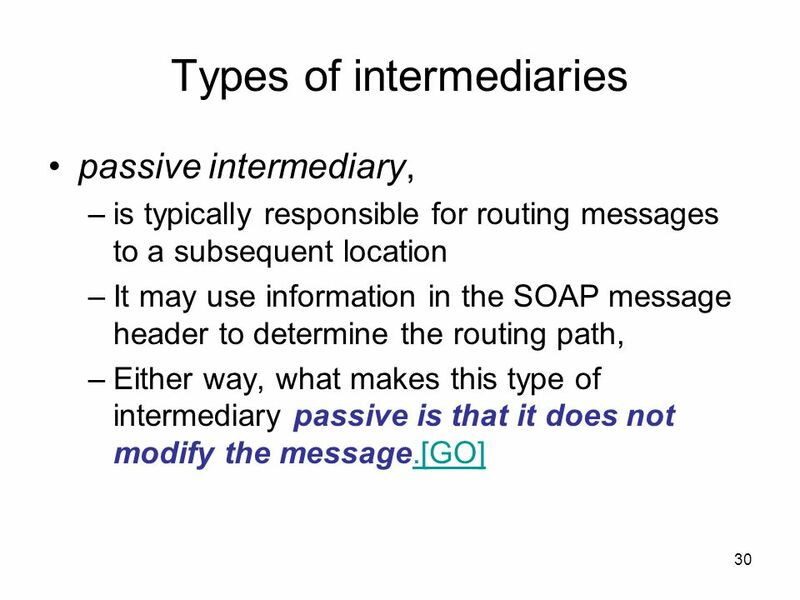 When the server with the lowest usage is identified, this passive intermediary routes the message accordingly. 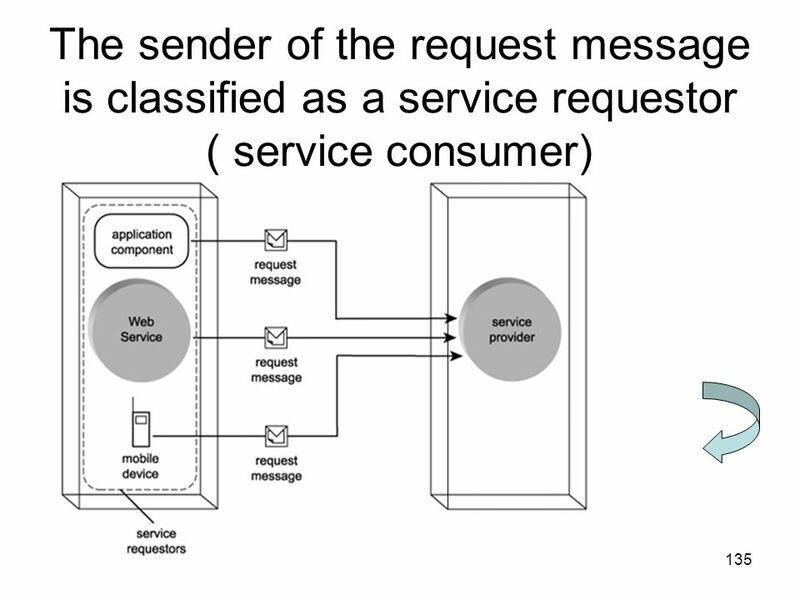 Upon receiving the message from the Invoice Submission Service requestor, the passive Load Balancing intermediary acts as the service provider. 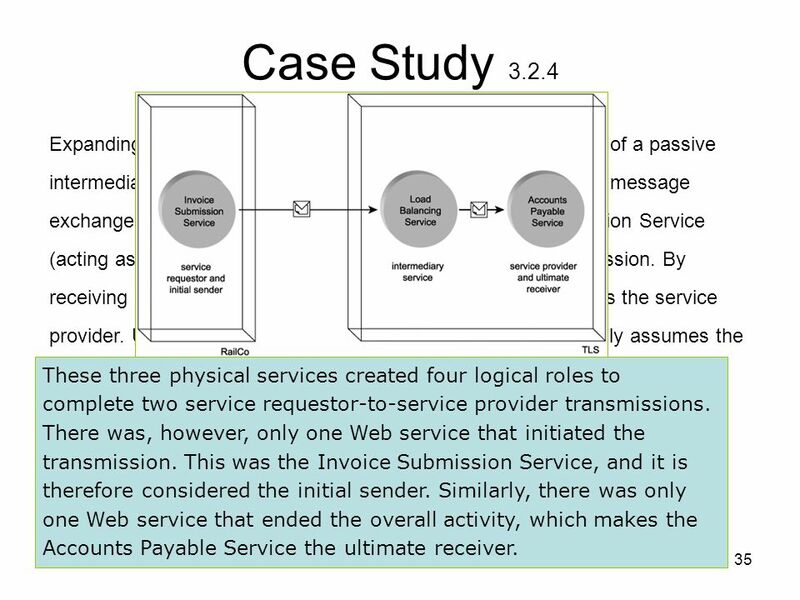 After it has determined where the message is to be forwarded to, it changes its role to service requestor to forward the invoice document to the destination Accounts Payable Service provider. 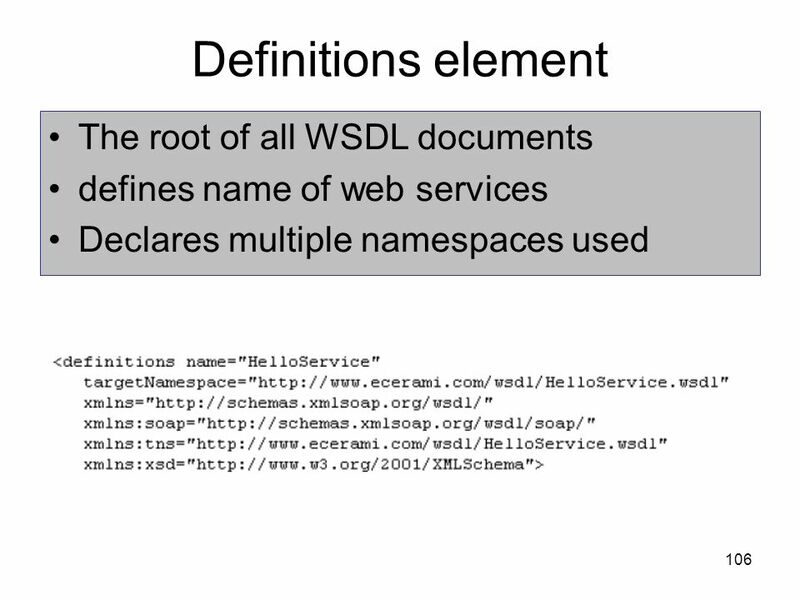 TLS employs a number of active intermediaries. The Internal Policy Service, for example, examines the message to determine whether it is subject to any internal policy restrictions. 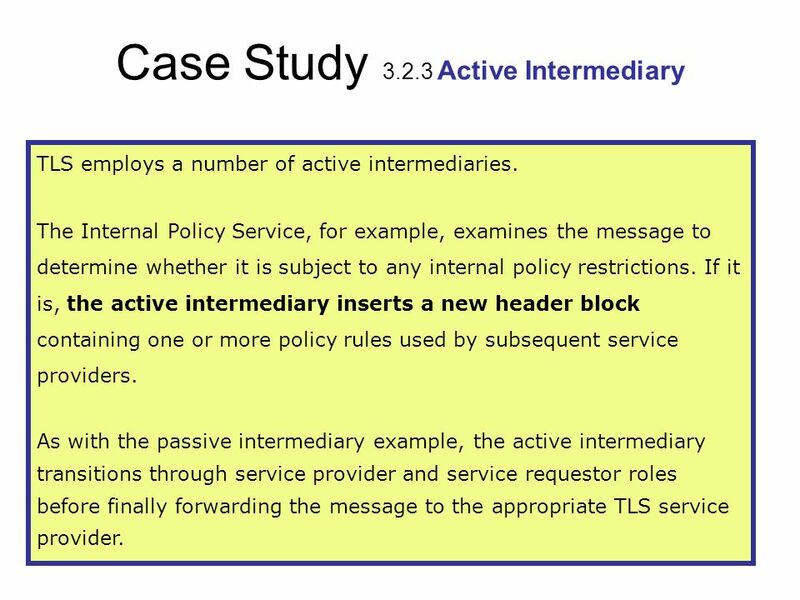 If it is, the active intermediary inserts a new header block containing one or more policy rules used by subsequent service providers. 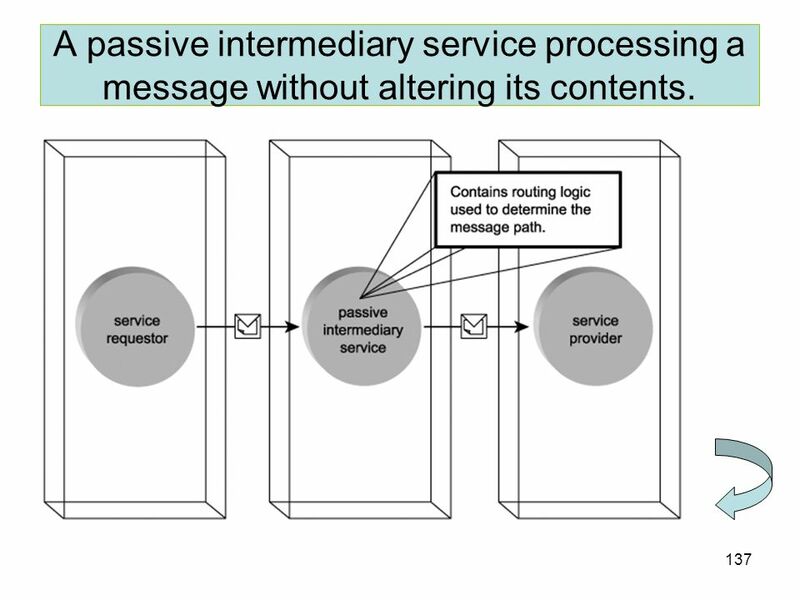 As with the passive intermediary example, the active intermediary transitions through service provider and service requestor roles before finally forwarding the message to the appropriate TLS service provider. 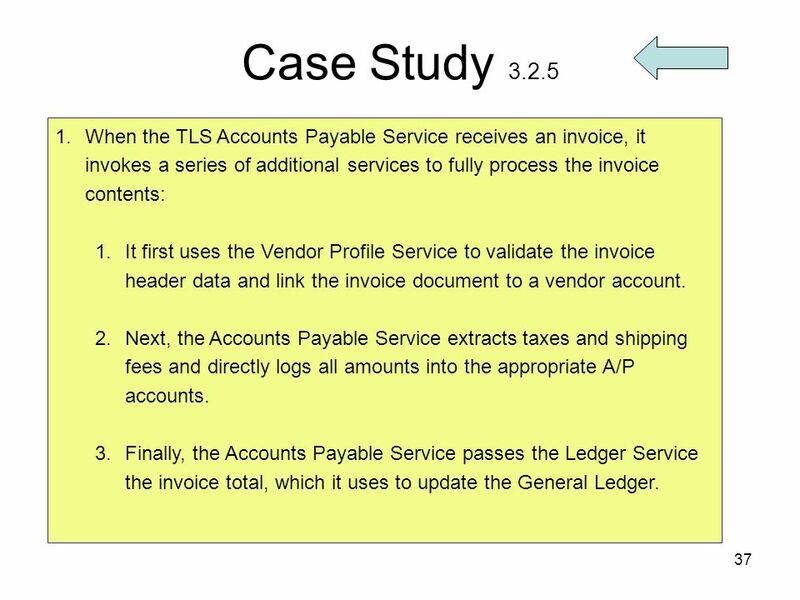 37 Case Study 3.2.5 When the TLS Accounts Payable Service receives an invoice, it invokes a series of additional services to fully process the invoice contents: It first uses the Vendor Profile Service to validate the invoice header data and link the invoice document to a vendor account. Next, the Accounts Payable Service extracts taxes and shipping fees and directly logs all amounts into the appropriate A/P accounts. 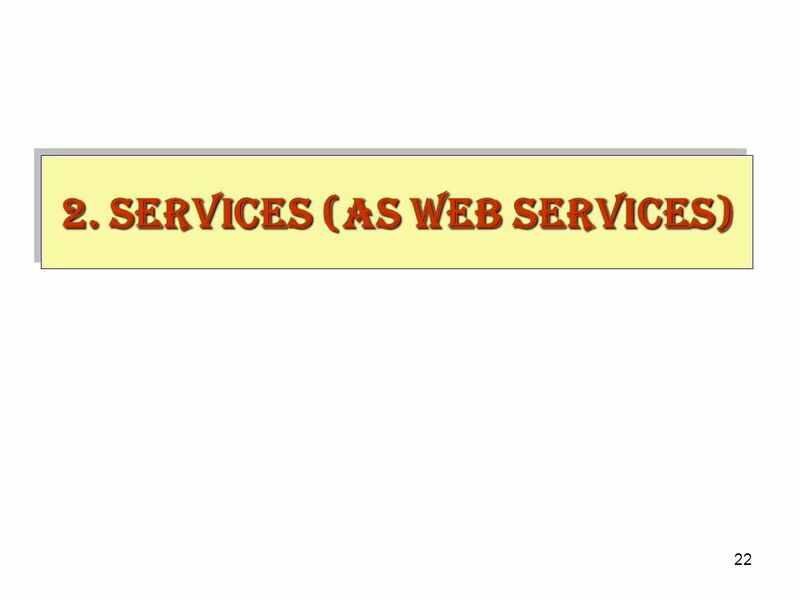 Finally, the Accounts Payable Service passes the Ledger Service the invoice total, which it uses to update the General Ledger. 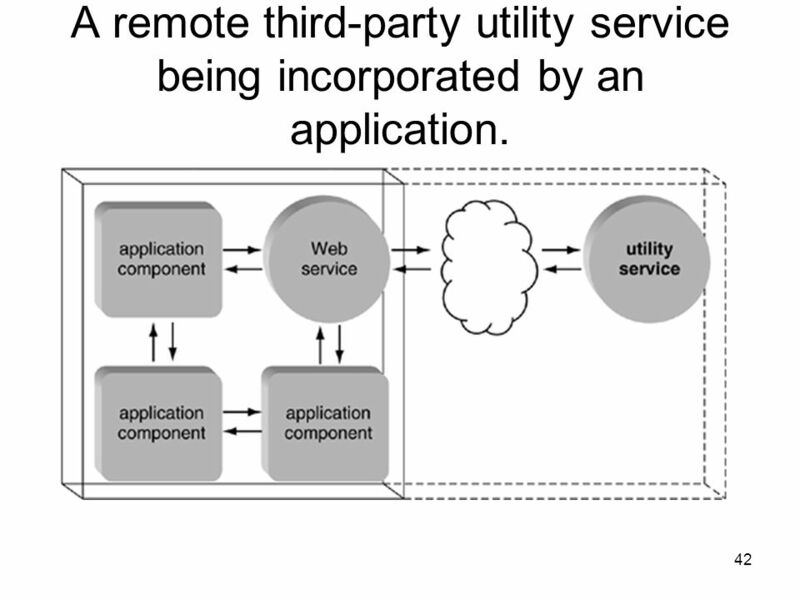 42 A remote third-party utility service being incorporated by an application. 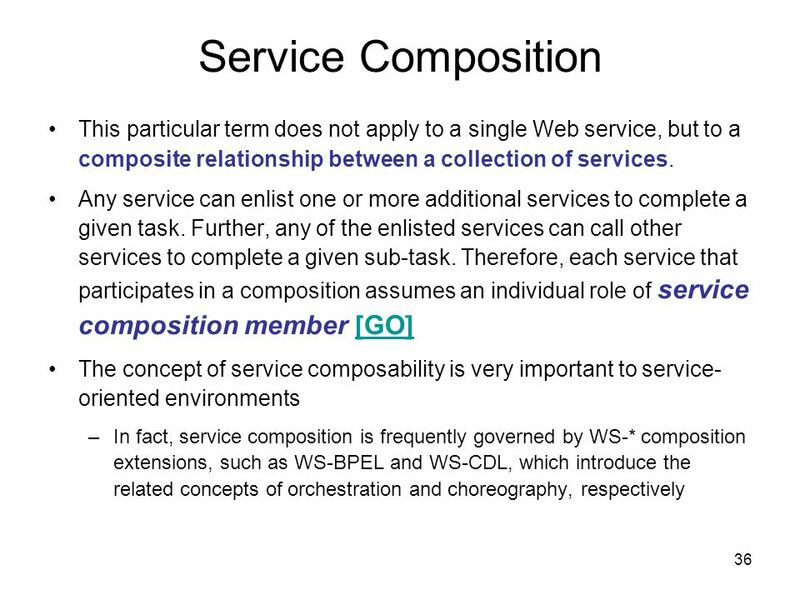 In the examples we've gone through so far in this lesson, we've described eight Web services. 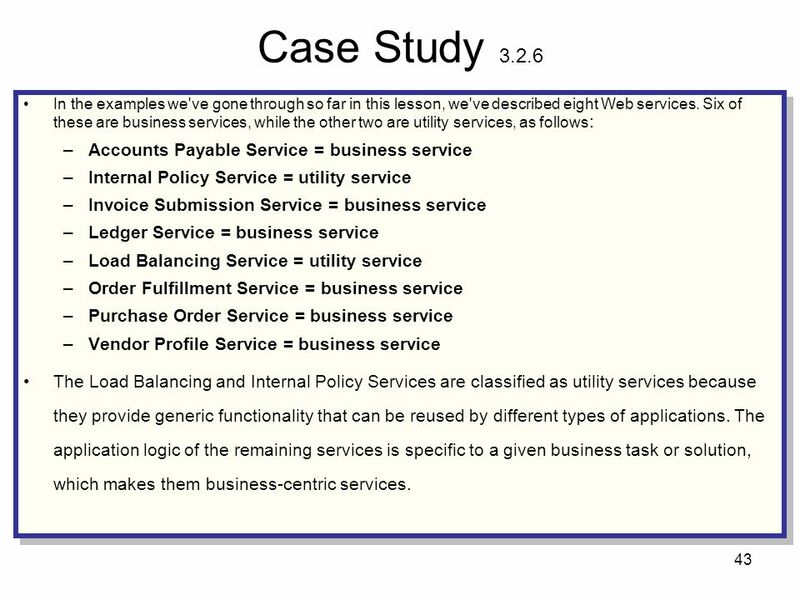 Six of these are business services, while the other two are utility services, as follows: Accounts Payable Service = business service Internal Policy Service = utility service Invoice Submission Service = business service Ledger Service = business service Load Balancing Service = utility service Order Fulfillment Service = business service Purchase Order Service = business service Vendor Profile Service = business service The Load Balancing and Internal Policy Services are classified as utility services because they provide generic functionality that can be reused by different types of applications. 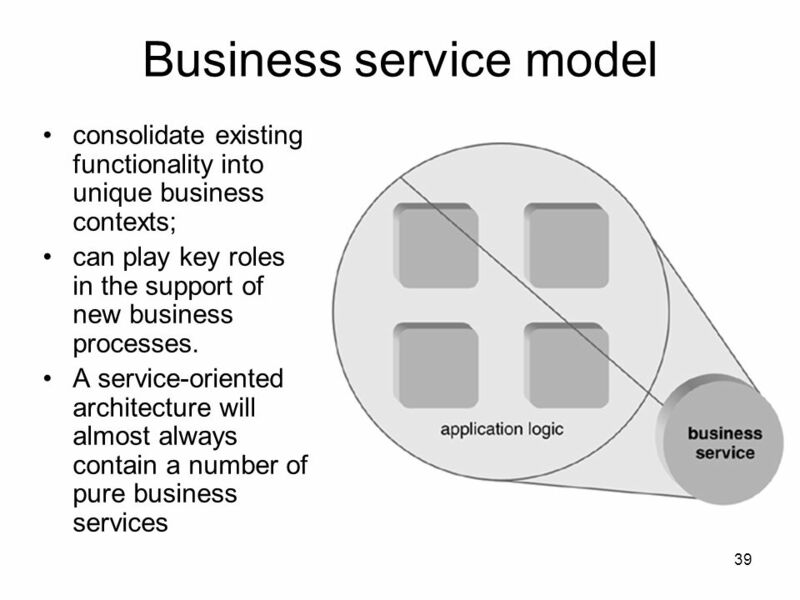 The application logic of the remaining services is specific to a given business task or solution, which makes them business-centric services. 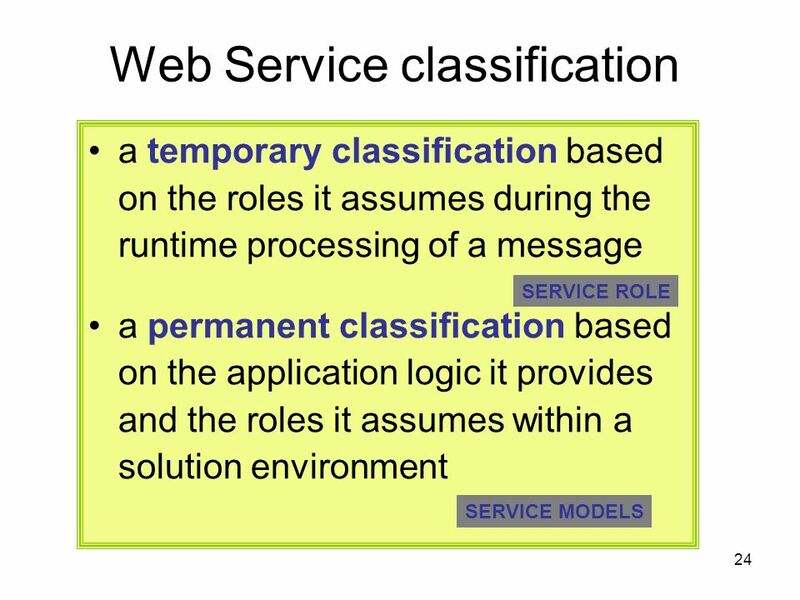 Web services can be labeled using temporary and permanent classifications. 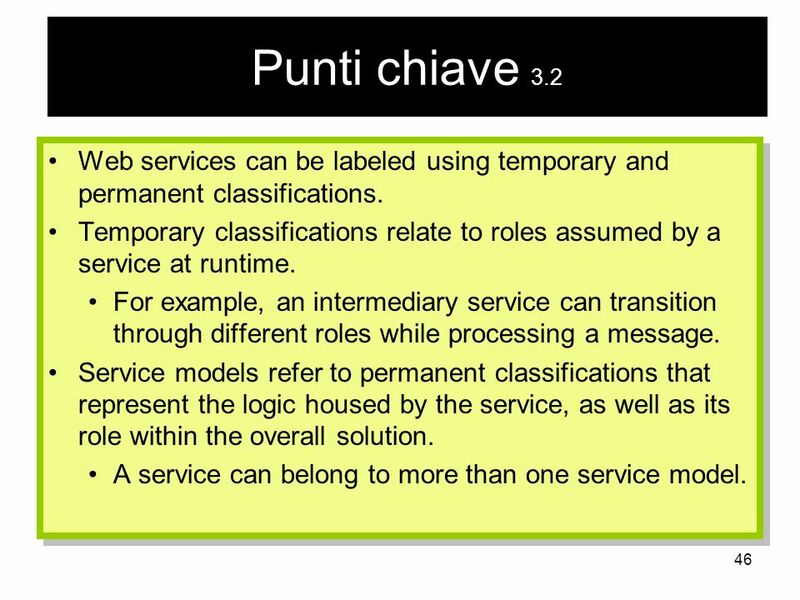 Temporary classifications relate to roles assumed by a service at runtime. 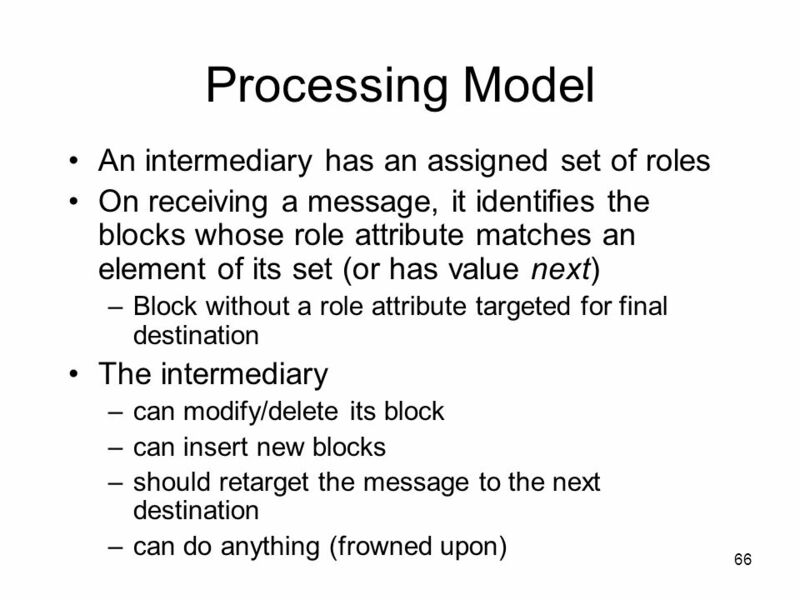 For example, an intermediary service can transition through different roles while processing a message. 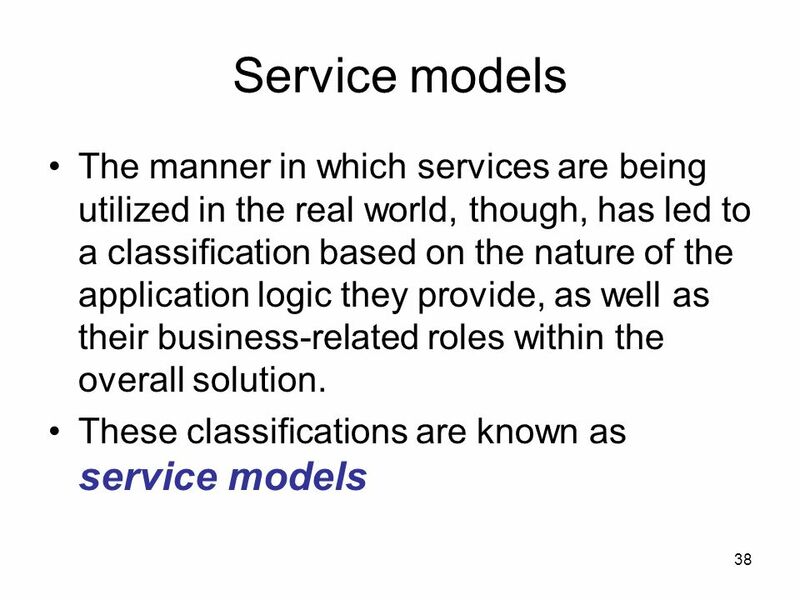 Service models refer to permanent classifications that represent the logic housed by the service, as well as its role within the overall solution. 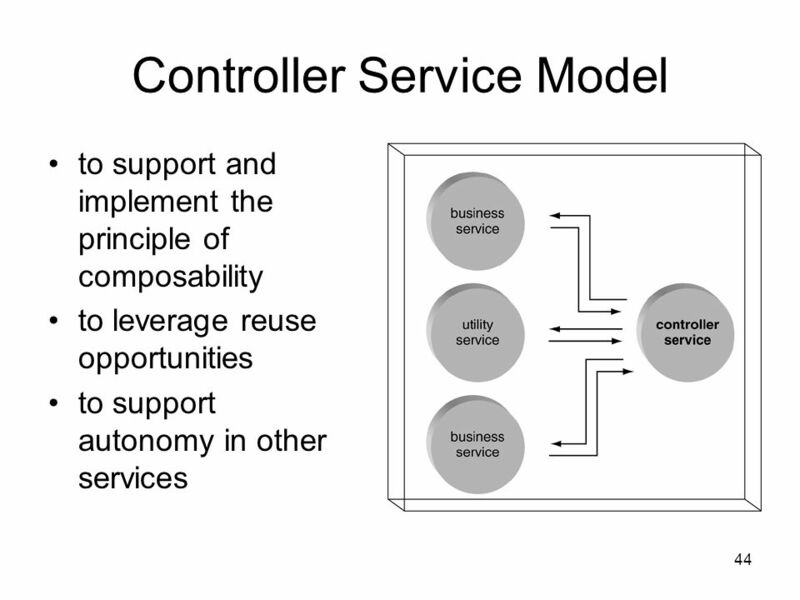 A service can belong to more than one service model. 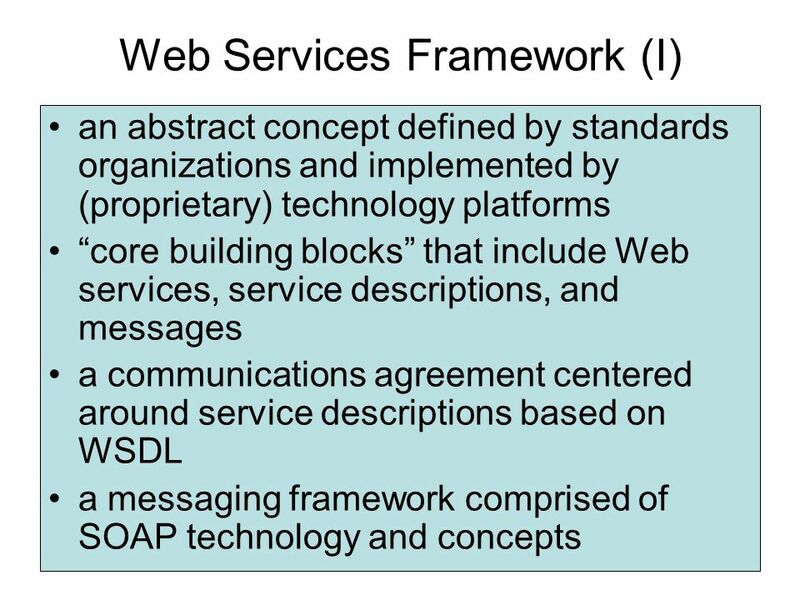 48 Messaging All communication between services is message-based , the messaging framework chosen must be standardized so that all services, regardless of origin, use the same format and transport protocol. 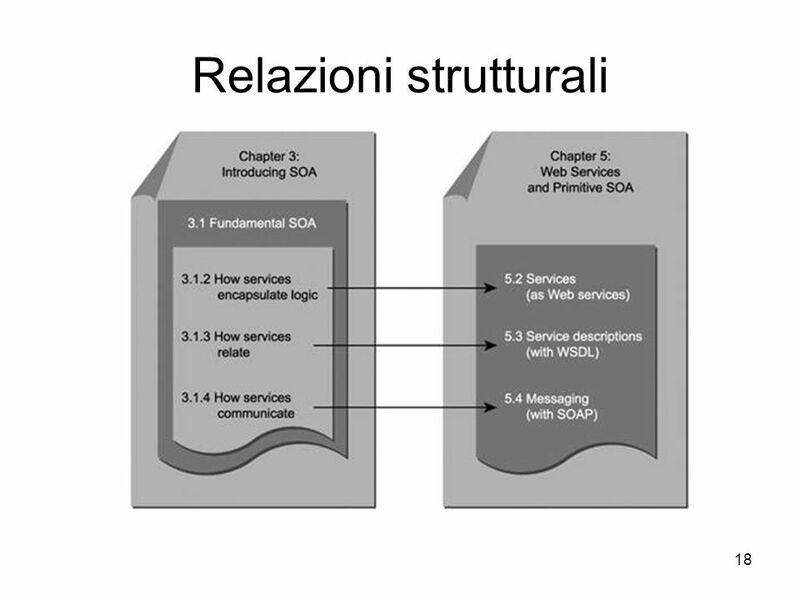 The receipt of a message by a service is the most fundamental action within SOA and the sole action that initiates service-oriented automation  messaging framework be extremely flexible and highly extensible. 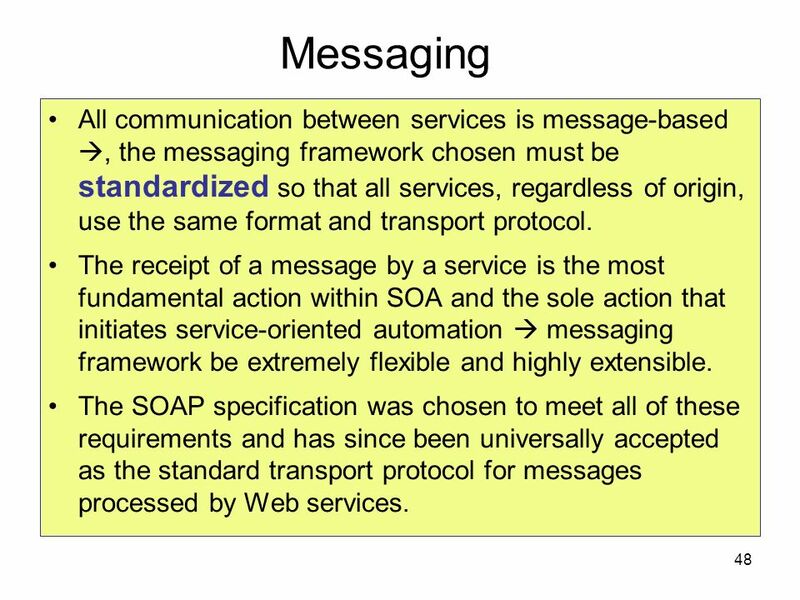 The SOAP specification was chosen to meet all of these requirements and has since been universally accepted as the standard transport protocol for messages processed by Web services. 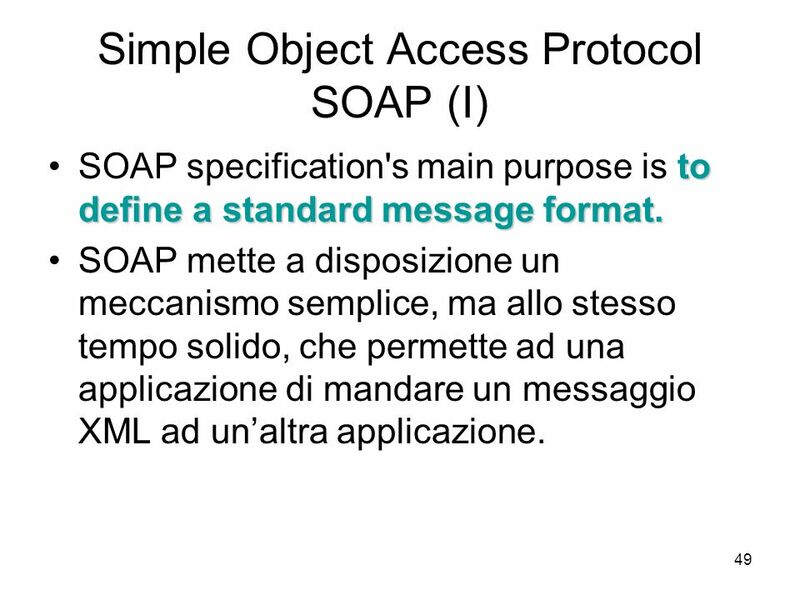 SOAP specification's main purpose is to define a standard message format. 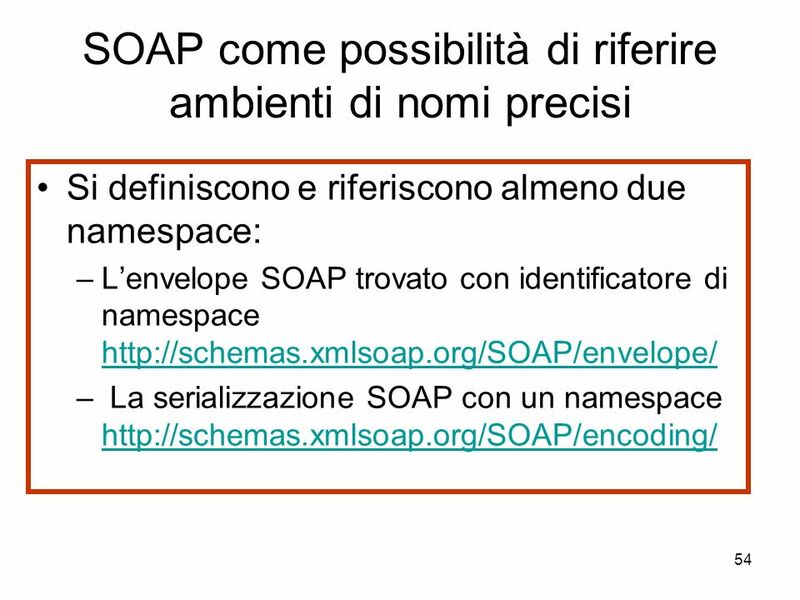 SOAP mette a disposizione un meccanismo semplice, ma allo stesso tempo solido, che permette ad una applicazione di mandare un messaggio XML ad un’altra applicazione. 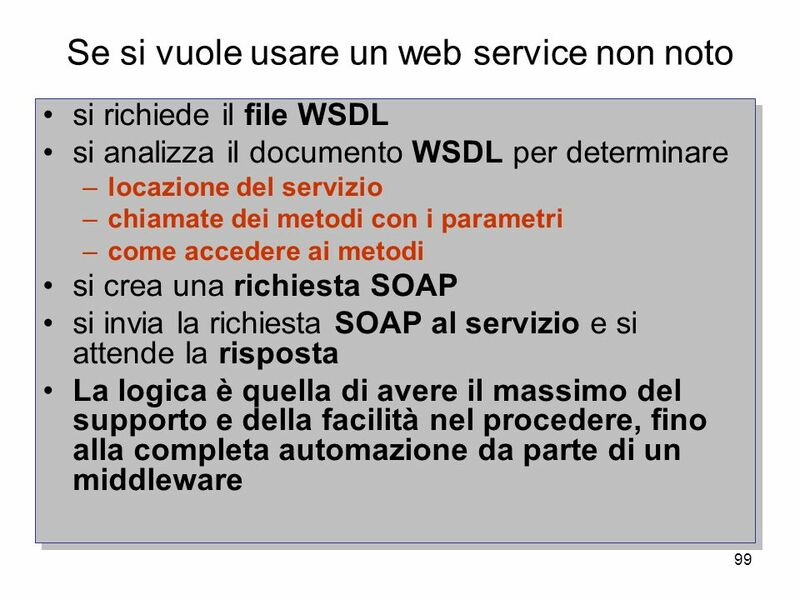 Il protocollo risponde alla necessità di lavorare con protocolli Web ma permettendo di specificare e progettare e gestire componenti e operazioni Soluzione per introdurre parametri e valori nei messaggi e per l'invocazione remota di oggetti basati su tecnologie Web Uso di XML per serializzazione dei dati e HTTP come protocollo di trasporto. 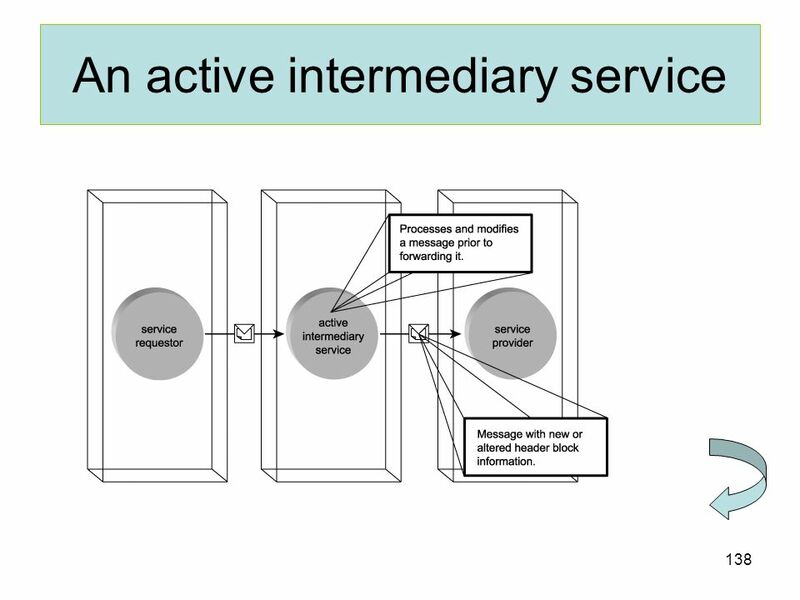 Extending the messaging infrastructure. 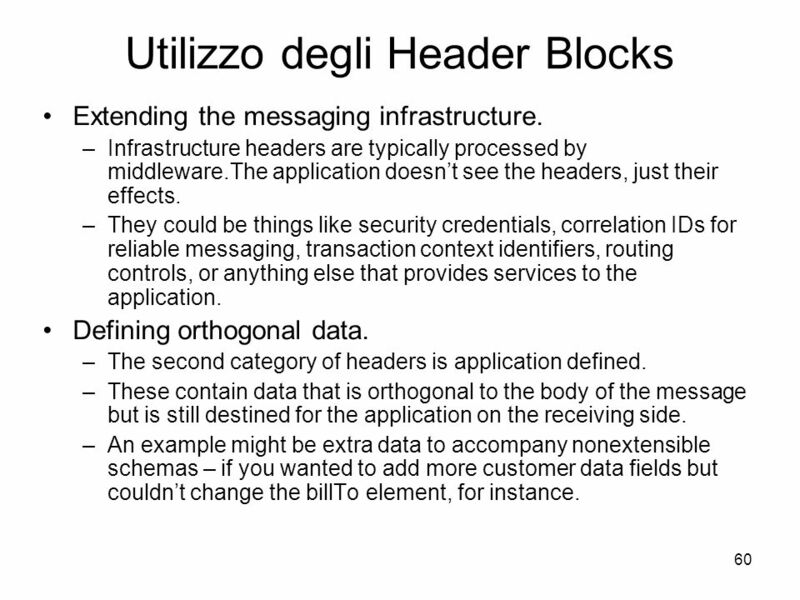 Infrastructure headers are typically processed by middleware.The application doesn’t see the headers, just their effects. 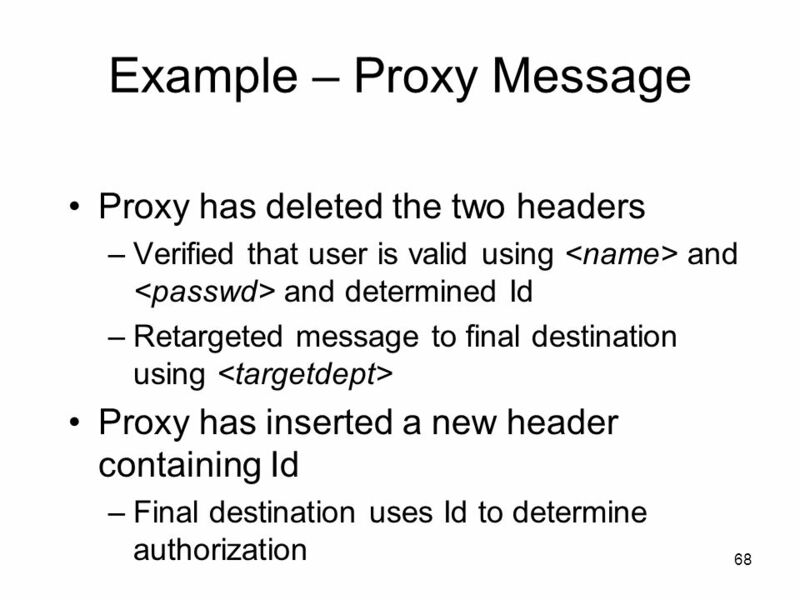 They could be things like security credentials, correlation IDs for reliable messaging, transaction context identifiers, routing controls, or anything else that provides services to the application. 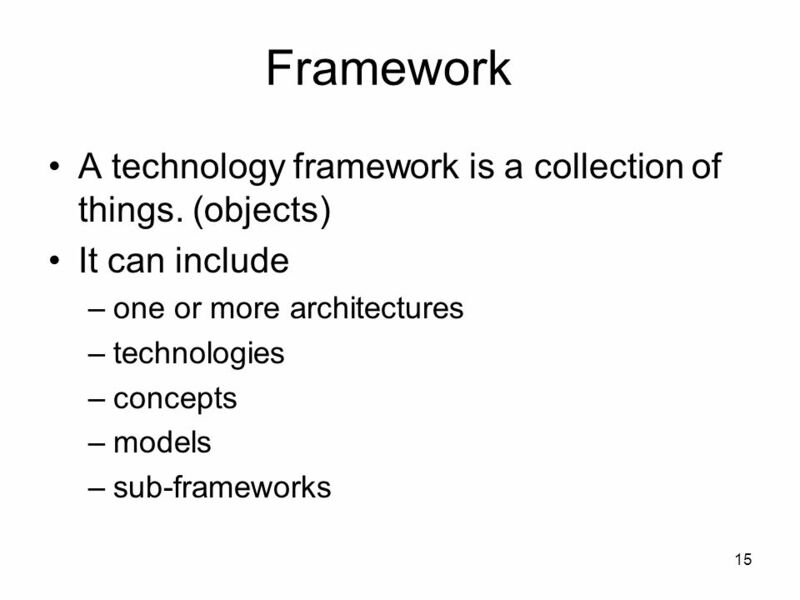 Defining orthogonal data. 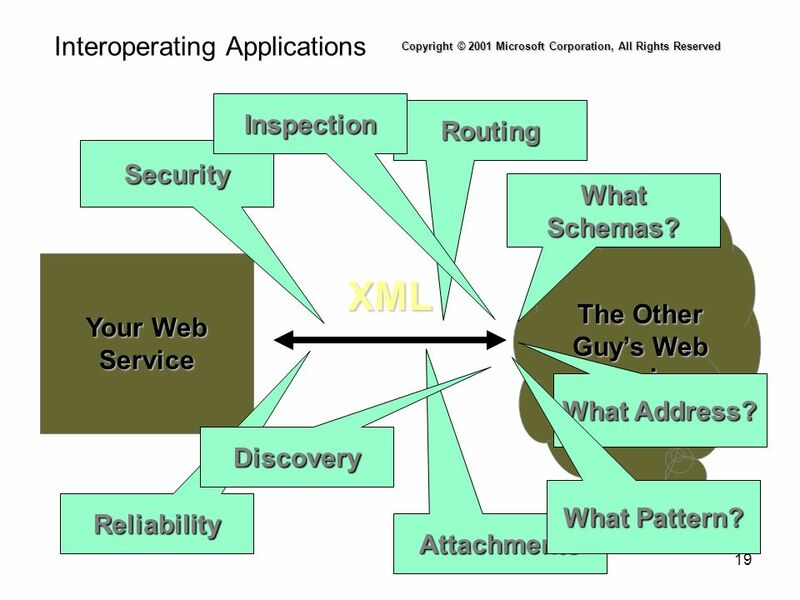 The second category of headers is application defined. 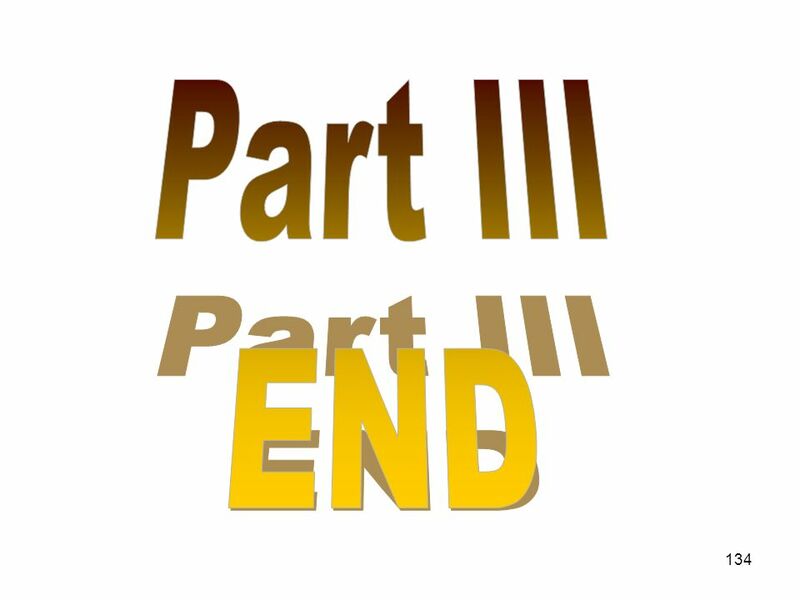 These contain data that is orthogonal to the body of the message but is still destined for the application on the receiving side. 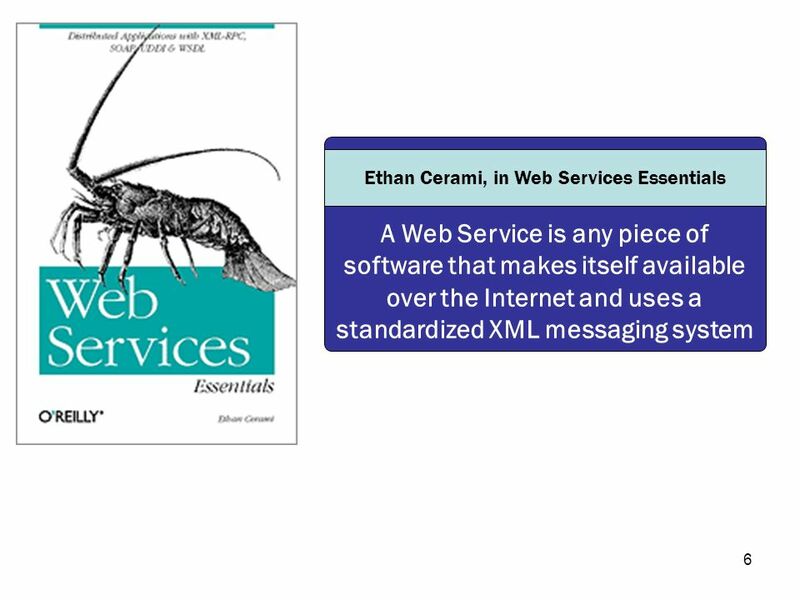 An example might be extra data to accompany nonextensible schemas – if you wanted to add more customer data fields but couldn’t change the billTo element, for instance. 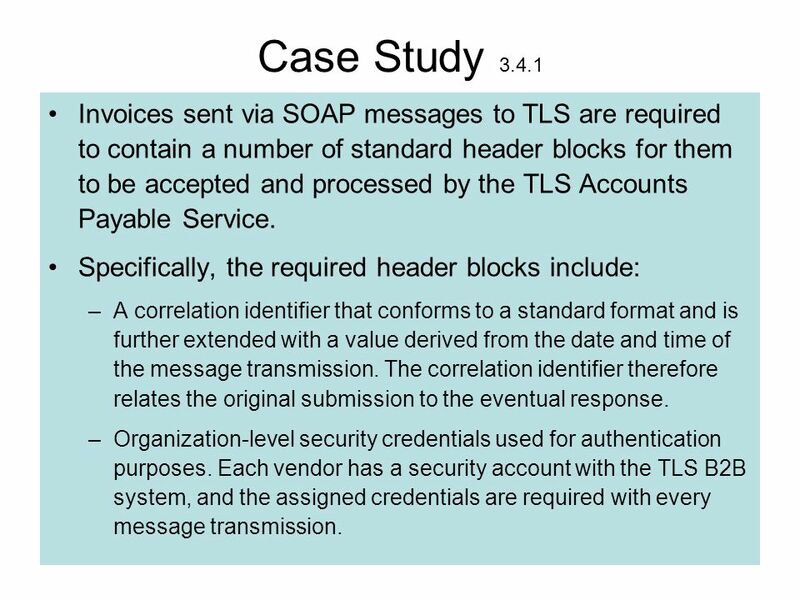 62 Case Study 3.4.1 Invoices sent via SOAP messages to TLS are required to contain a number of standard header blocks for them to be accepted and processed by the TLS Accounts Payable Service. 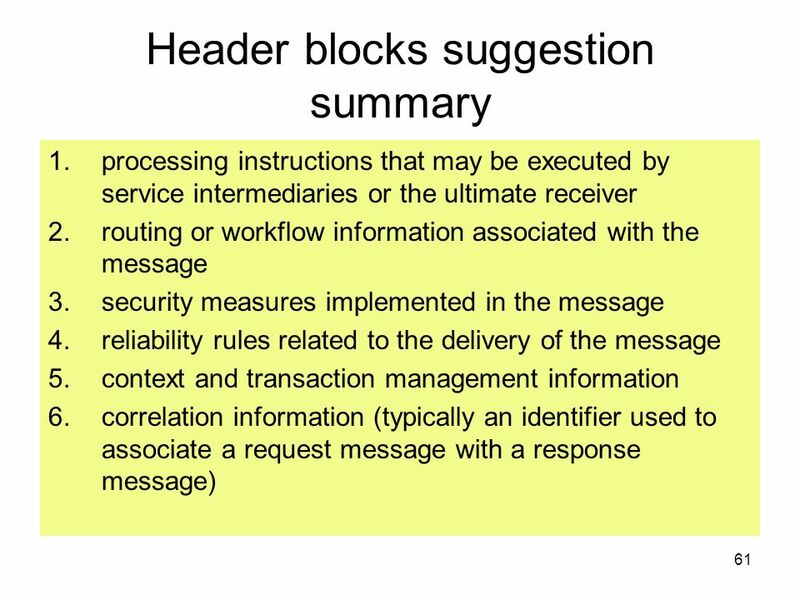 Specifically, the required header blocks include: A correlation identifier that conforms to a standard format and is further extended with a value derived from the date and time of the message transmission. 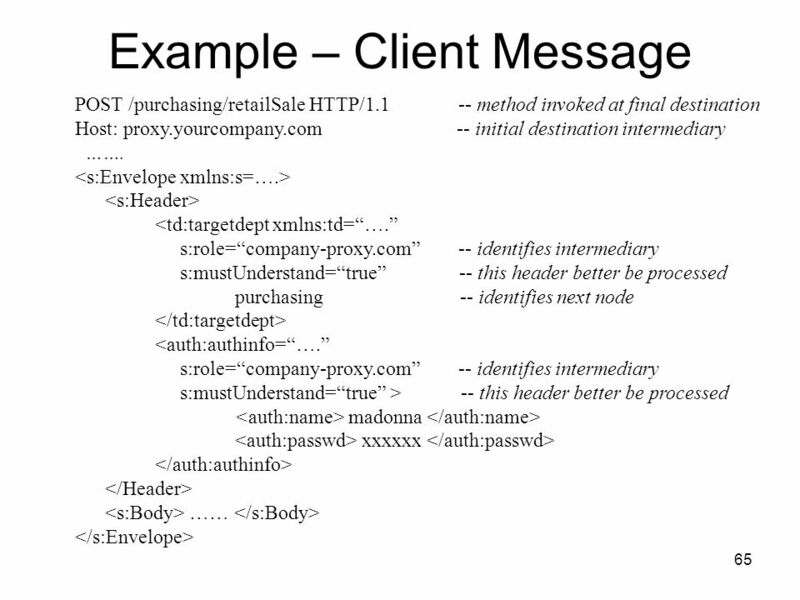 The correlation identifier therefore relates the original submission to the eventual response. 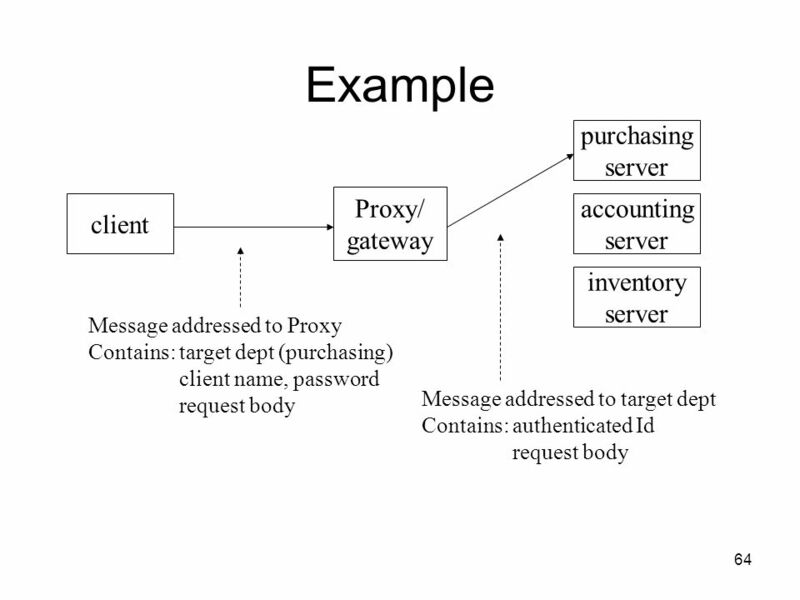 Organization-level security credentials used for authentication purposes. 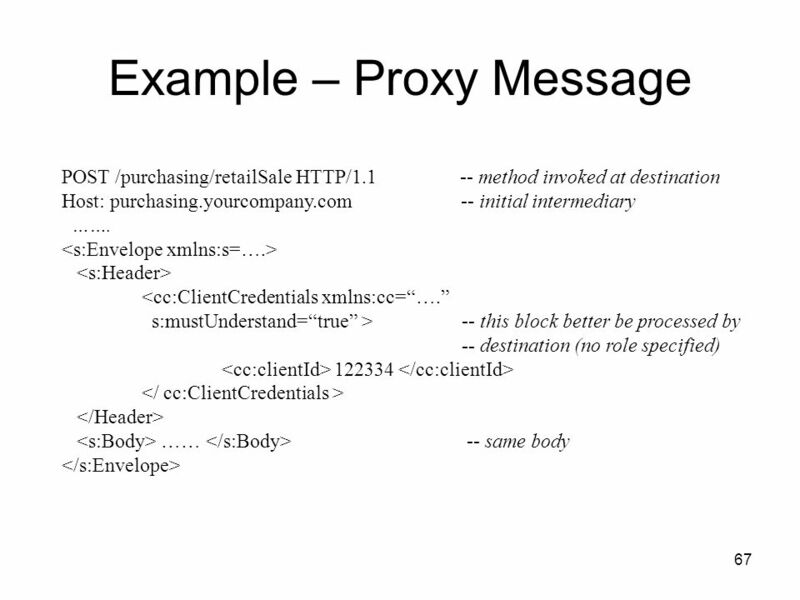 Each vendor has a security account with the TLS B2B system, and the assigned credentials are required with every message transmission. 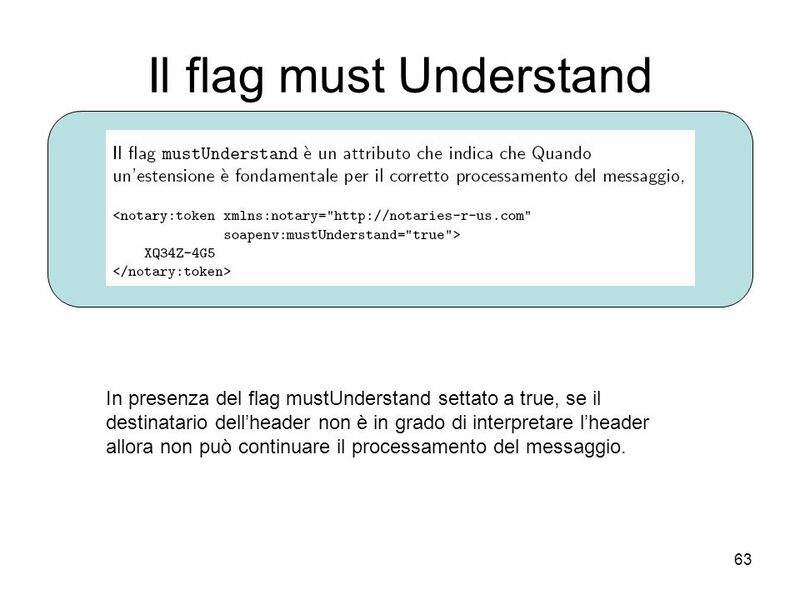 In presenza del flag mustUnderstand settato a true, se il destinatario dell’header non è in grado di interpretare l’header allora non può continuare il processamento del messaggio. 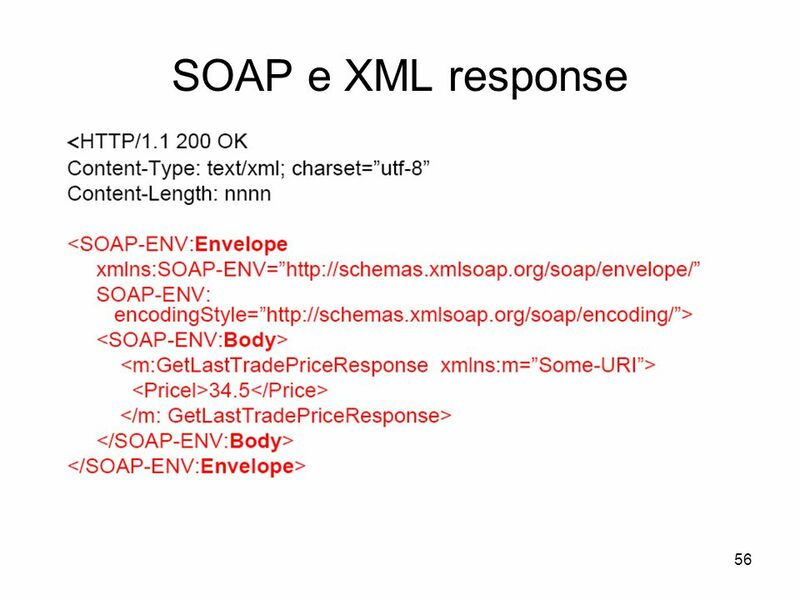 SOAP attachment to facilitate requirements for the delivery of data not so easily formatted into an XML document Each provides a different encoding mechanism used to bundle data in its native format with a SOAP message. 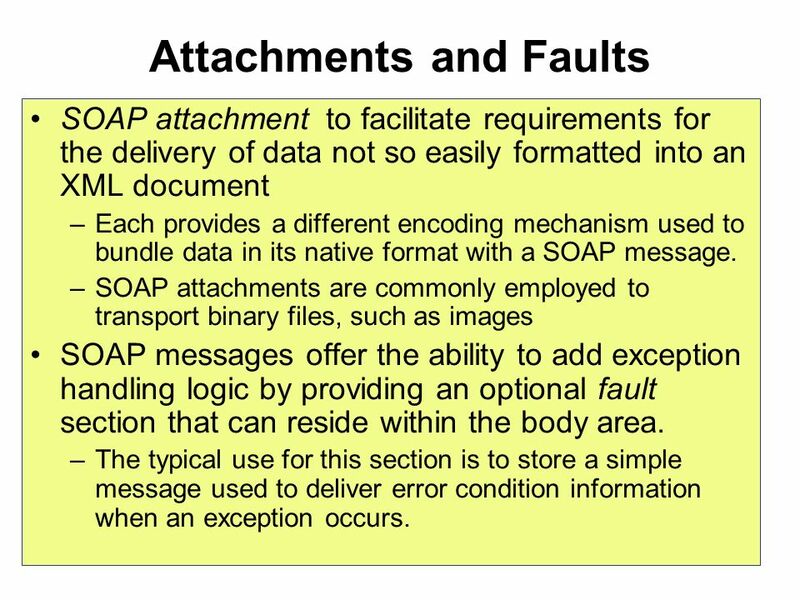 SOAP attachments are commonly employed to transport binary files, such as images SOAP messages offer the ability to add exception handling logic by providing an optional fault section that can reside within the body area. 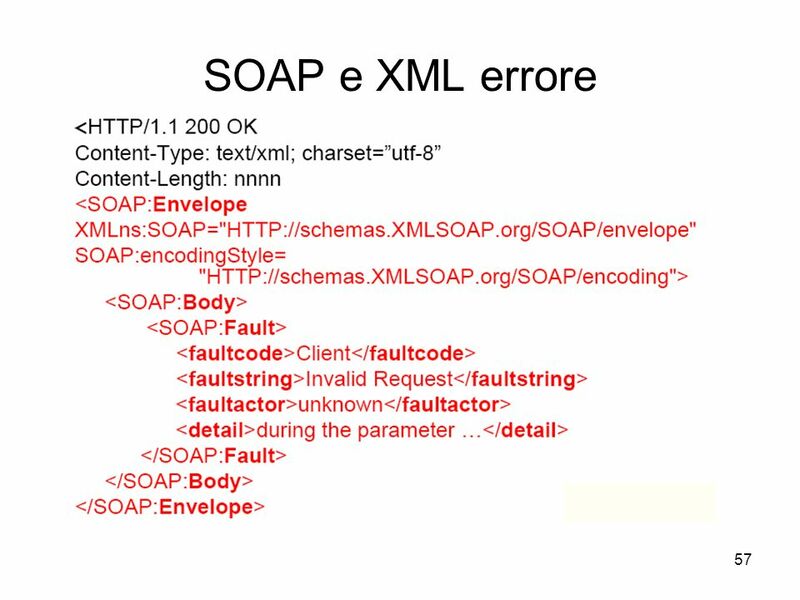 The typical use for this section is to store a simple message used to deliver error condition information when an exception occurs. 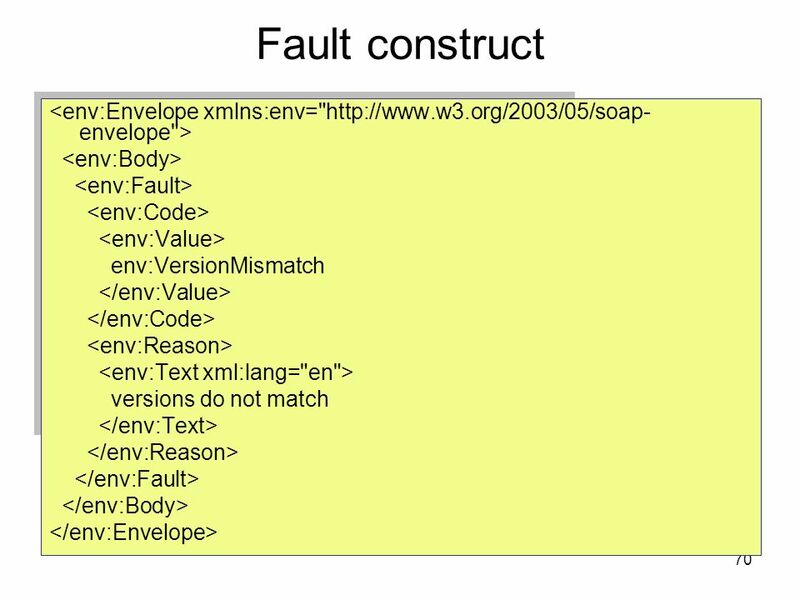 72 Case Study 3.4.3 The before mentioned SOAP message containing a SOAP attachment is also outfitted with a fault area housing exception information relating specifically to the attached data. 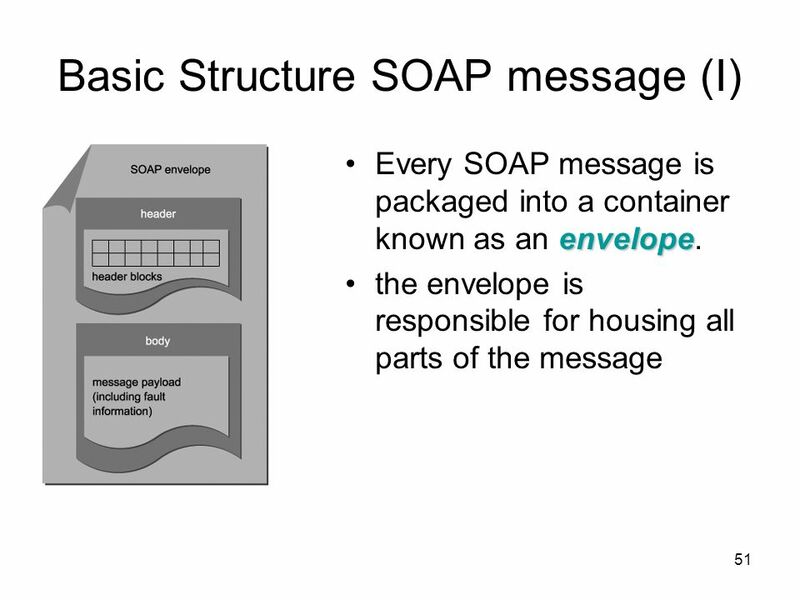 Should the recipient of the SOAP message be unable to properly process the attachment or should the attachment encounter delivery problems, standard fault codes and descriptions are used to generate a response message that is returned to TLS. 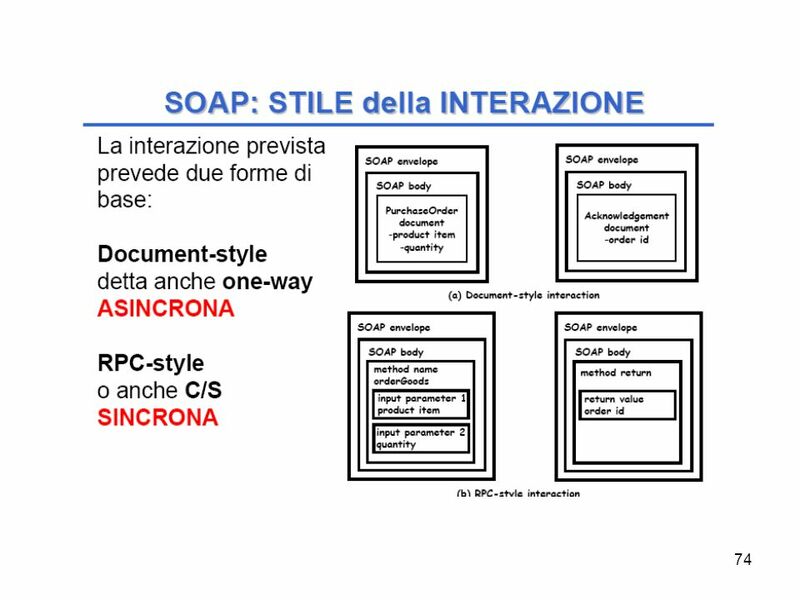 Due possibili modi di utilizzare la tecnologia SOAP: Document e RPC. 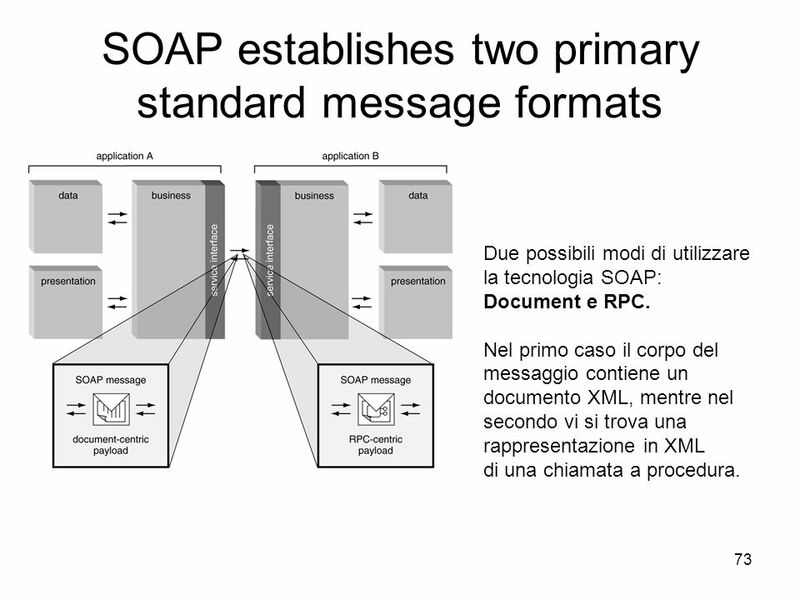 Nel primo caso il corpo del messaggio contiene un documento XML, mentre nel secondo vi si trova una rappresentazione in XML di una chiamata a procedura. 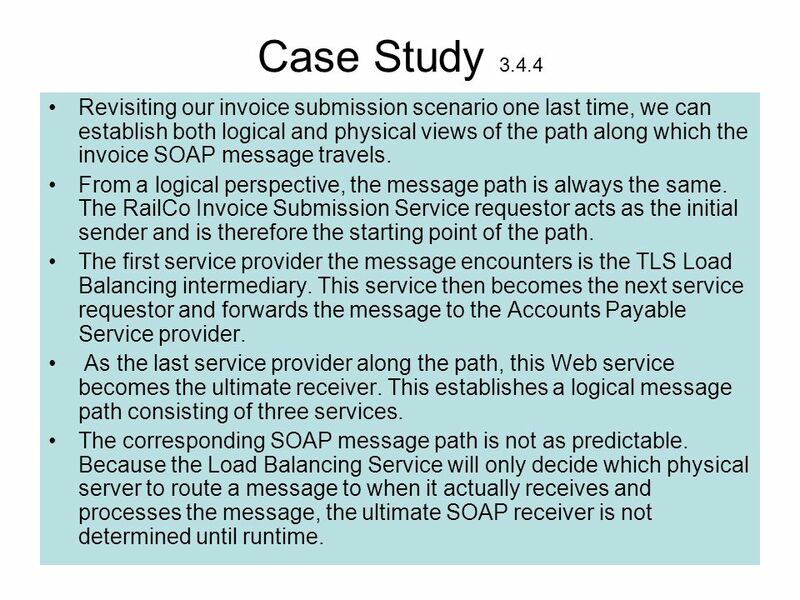 80 Case Study 3.4.4 Revisiting our invoice submission scenario one last time, we can establish both logical and physical views of the path along which the invoice SOAP message travels. 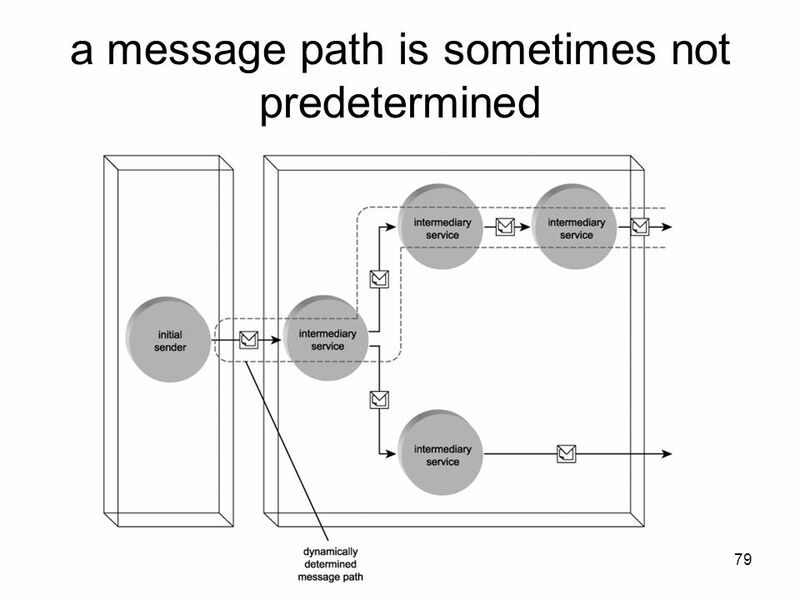 From a logical perspective, the message path is always the same. 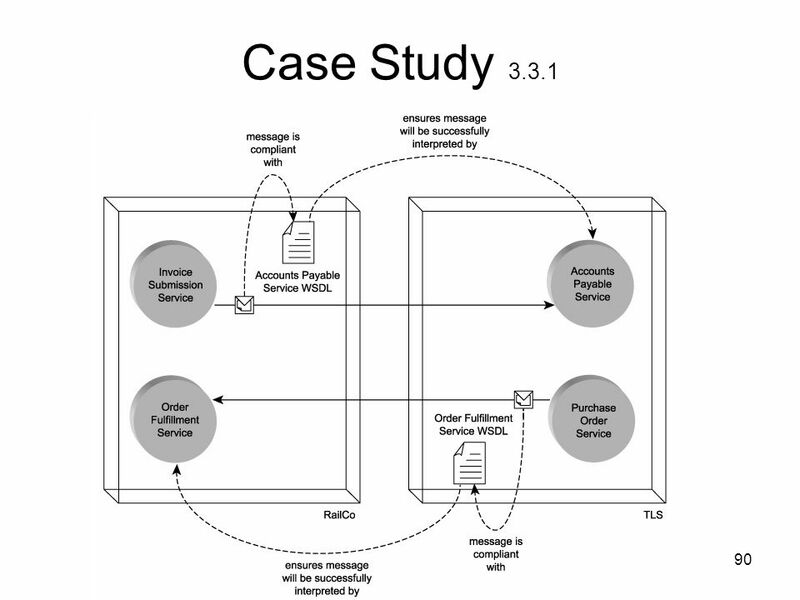 The RailCo Invoice Submission Service requestor acts as the initial sender and is therefore the starting point of the path. 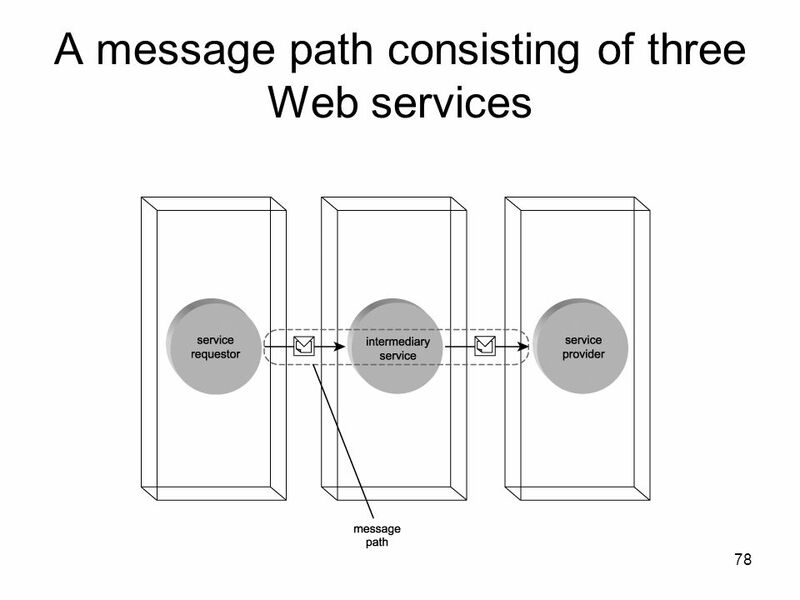 The first service provider the message encounters is the TLS Load Balancing intermediary. 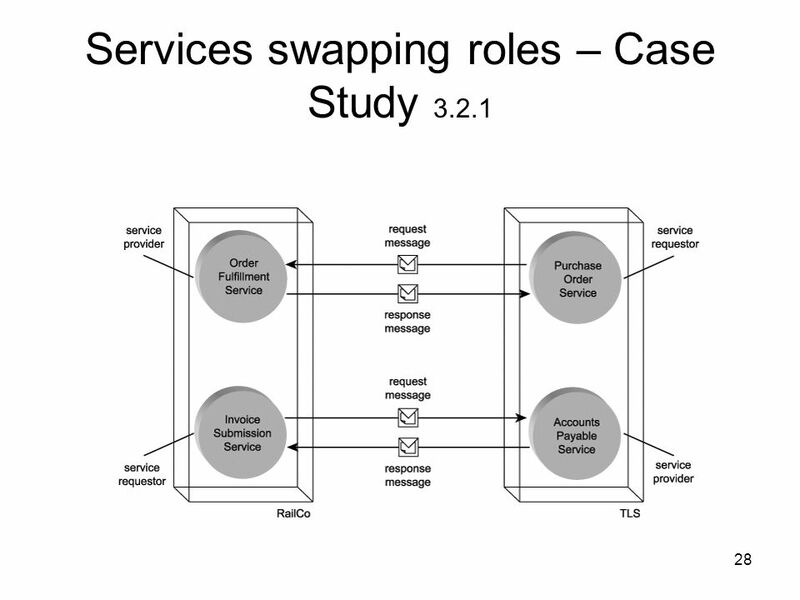 This service then becomes the next service requestor and forwards the message to the Accounts Payable Service provider. 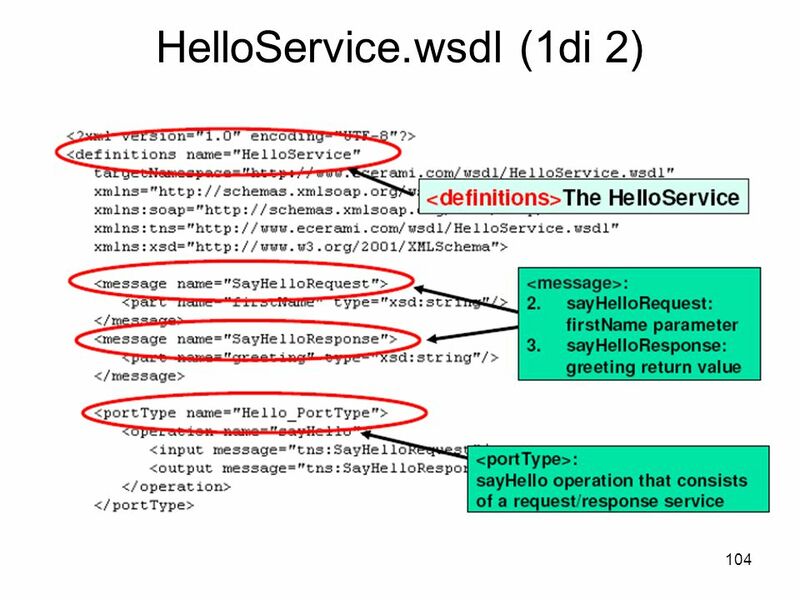 As the last service provider along the path, this Web service becomes the ultimate receiver. 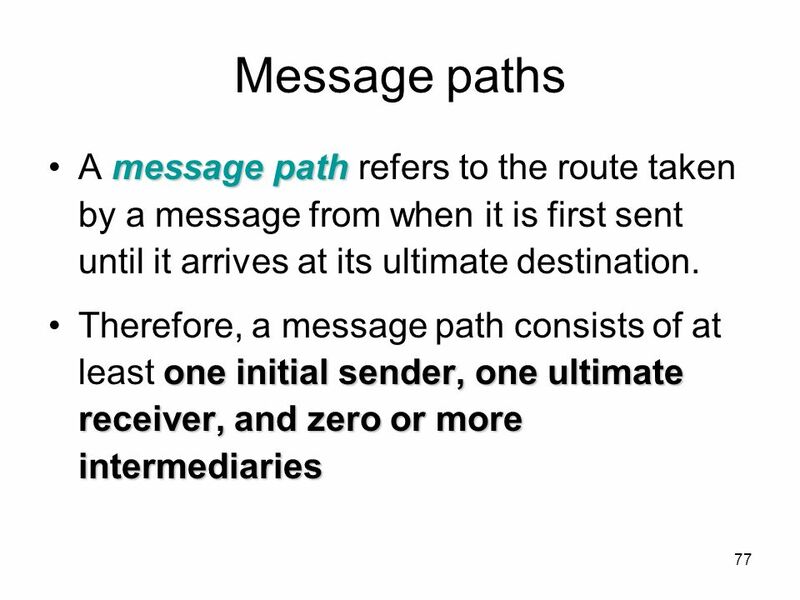 This establishes a logical message path consisting of three services. 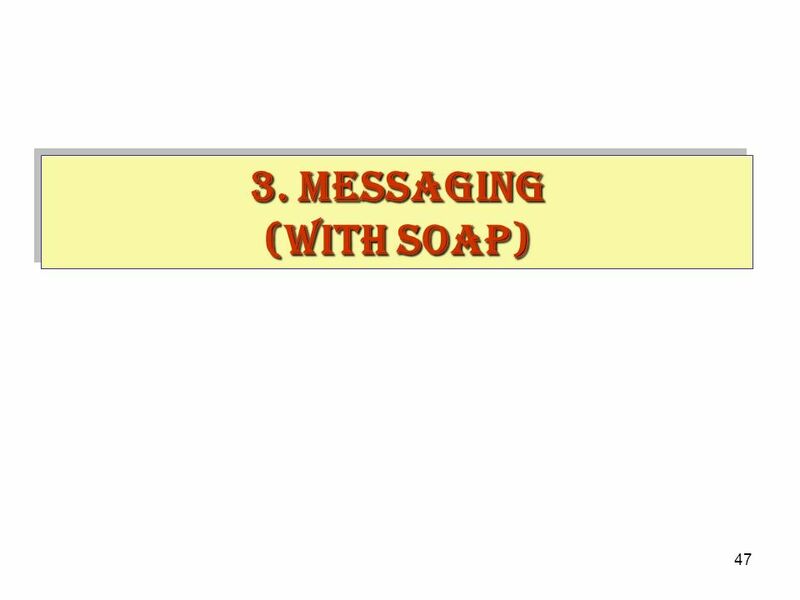 The corresponding SOAP message path is not as predictable. 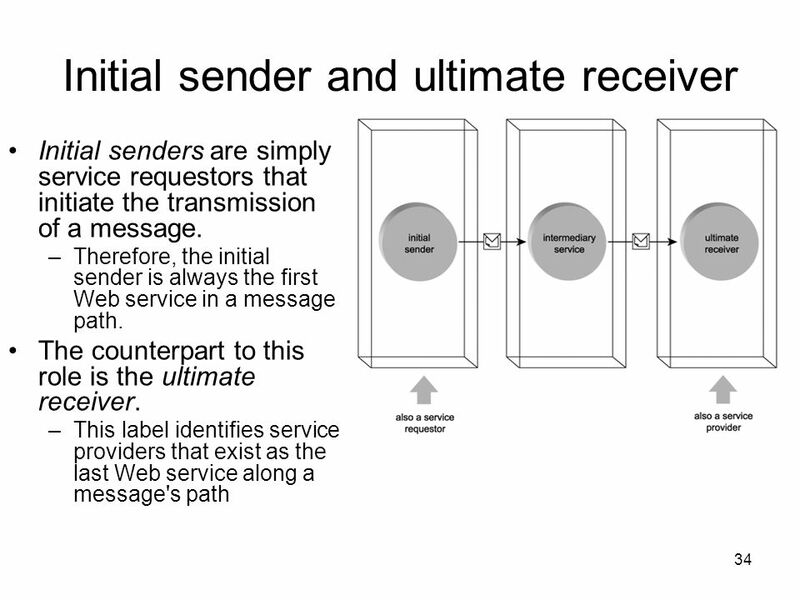 Because the Load Balancing Service will only decide which physical server to route a message to when it actually receives and processes the message, the ultimate SOAP receiver is not determined until runtime. 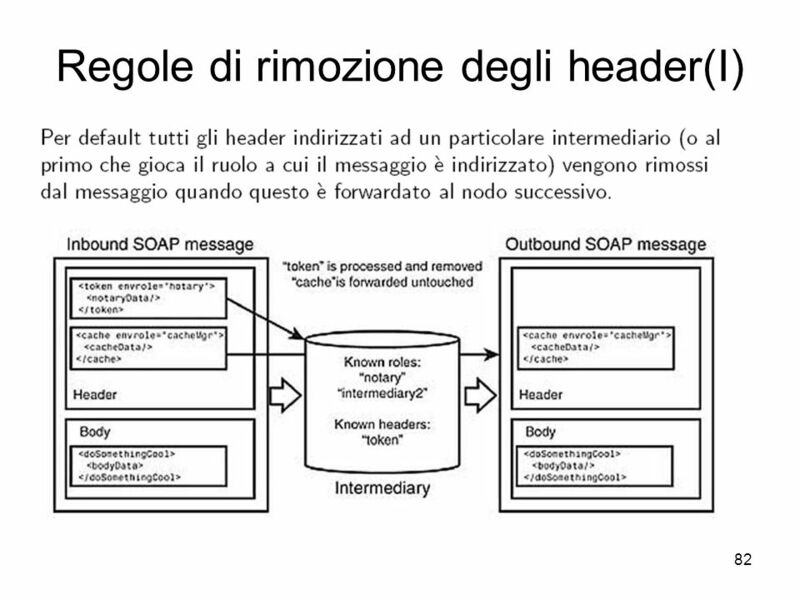 Gli intermediari possono essere classificati anche in funzione dell’utilizzo che fanno degli headers: Forwarding Intermediaries Intermediari che processano e operano sul messaggio secondo le indicazioni contenute negli header del messaggio stesso. 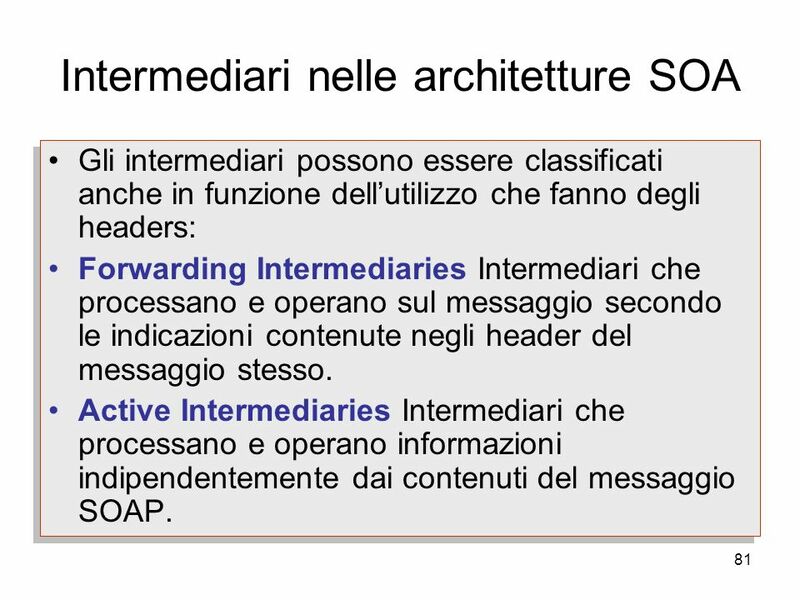 Active Intermediaries Intermediari che processano e operano informazioni indipendentemente dai contenuti del messaggio SOAP. 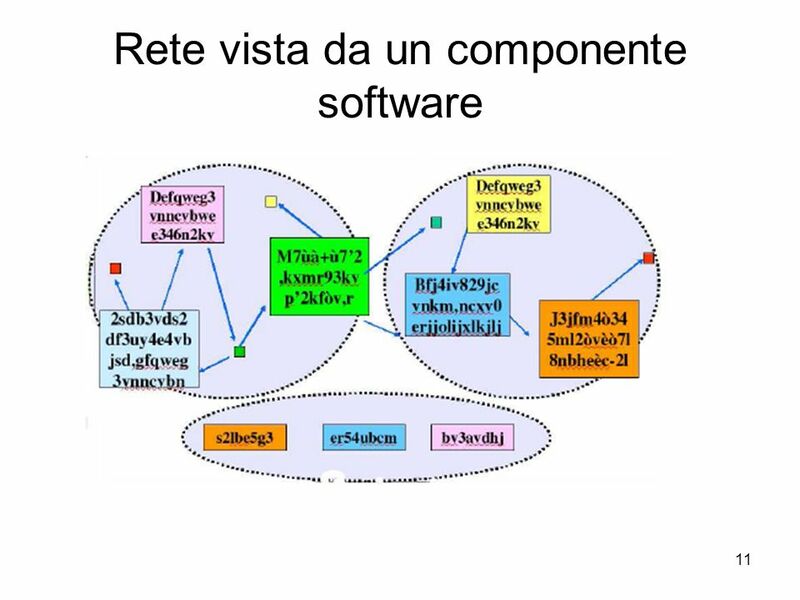 Determinare l’insieme di ruoli che deve interpretare. 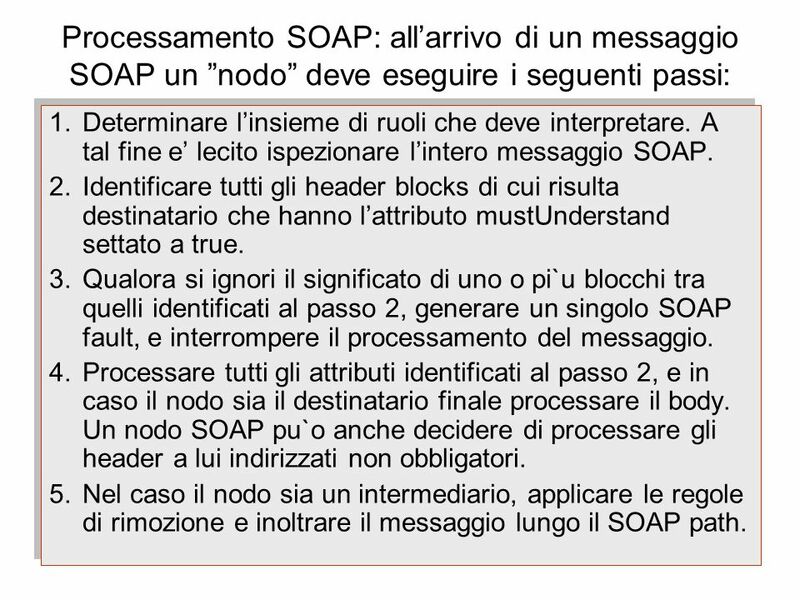 A tal fine e’ lecito ispezionare l’intero messaggio SOAP. 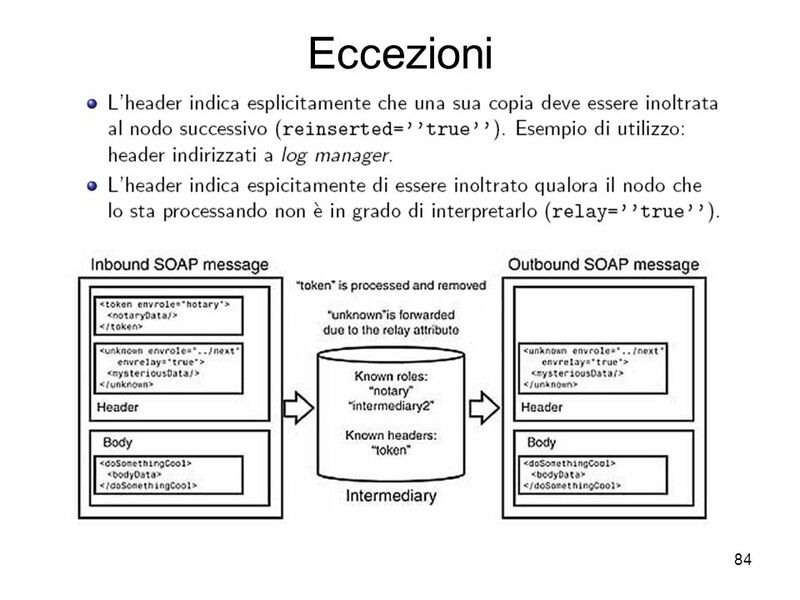 Identificare tutti gli header blocks di cui risulta destinatario che hanno l’attributo mustUnderstand settato a true. 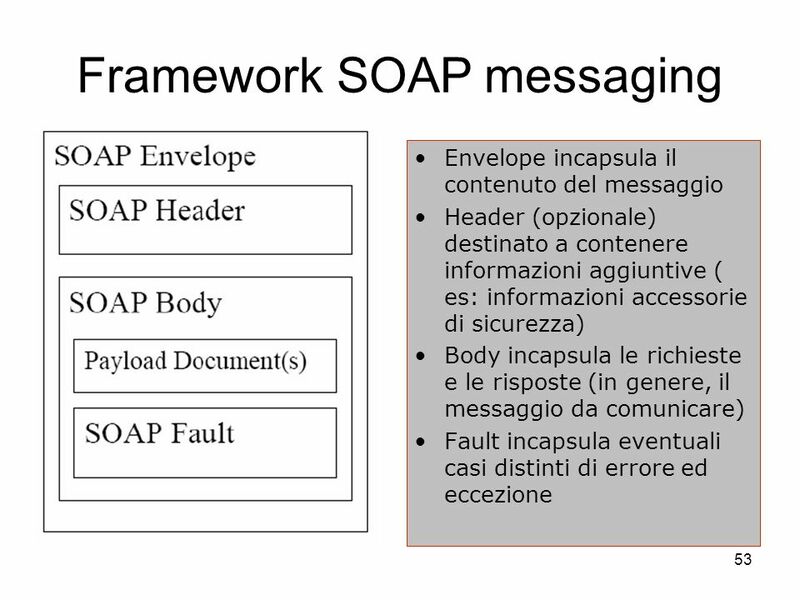 Qualora si ignori il significato di uno o pi`u blocchi tra quelli identificati al passo 2, generare un singolo SOAP fault, e interrompere il processamento del messaggio. 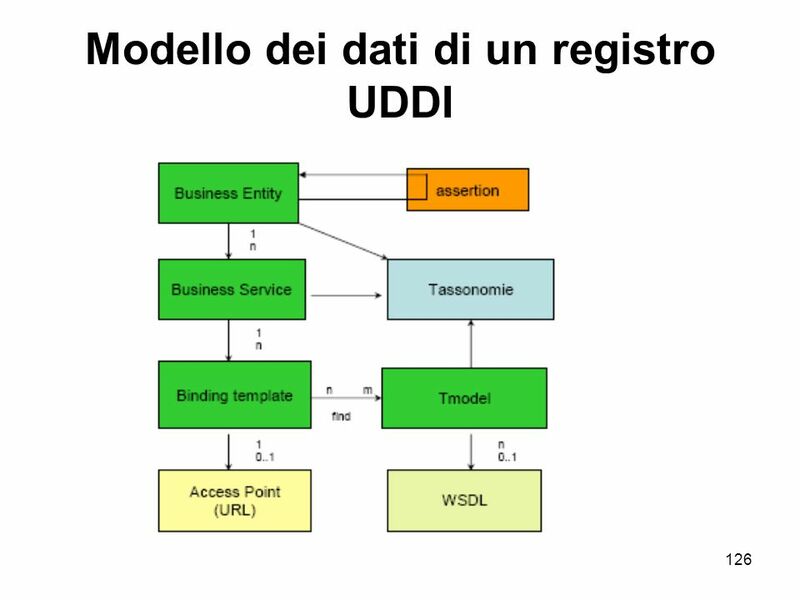 Processare tutti gli attributi identificati al passo 2, e in caso il nodo sia il destinatario finale processare il body. 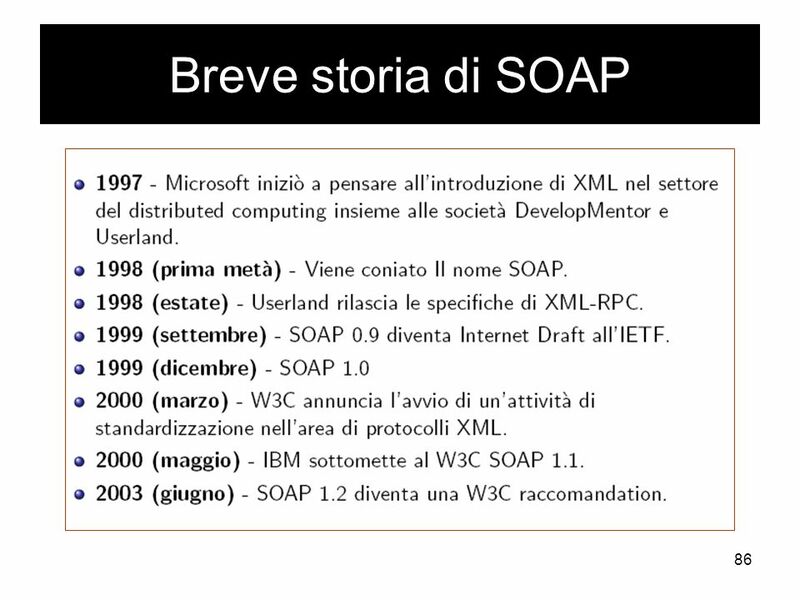 Un nodo SOAP pu`o anche decidere di processare gli header a lui indirizzati non obbligatori. 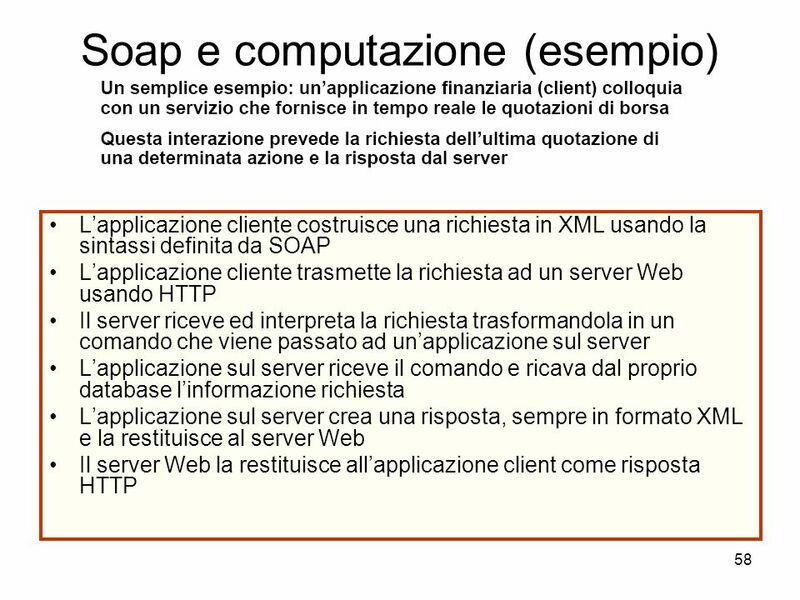 Nel caso il nodo sia un intermediario, applicare le regole di rimozione e inoltrare il messaggio lungo il SOAP path. 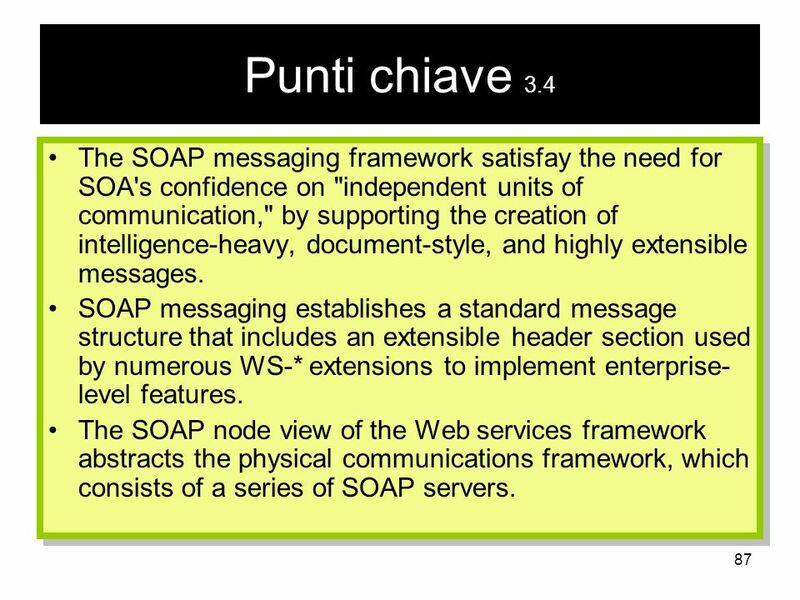 87 Punti chiave 3.4 The SOAP messaging framework satisfay the need for SOA's confidence on "independent units of communication," by supporting the creation of intelligence-heavy, document-style, and highly extensible messages. 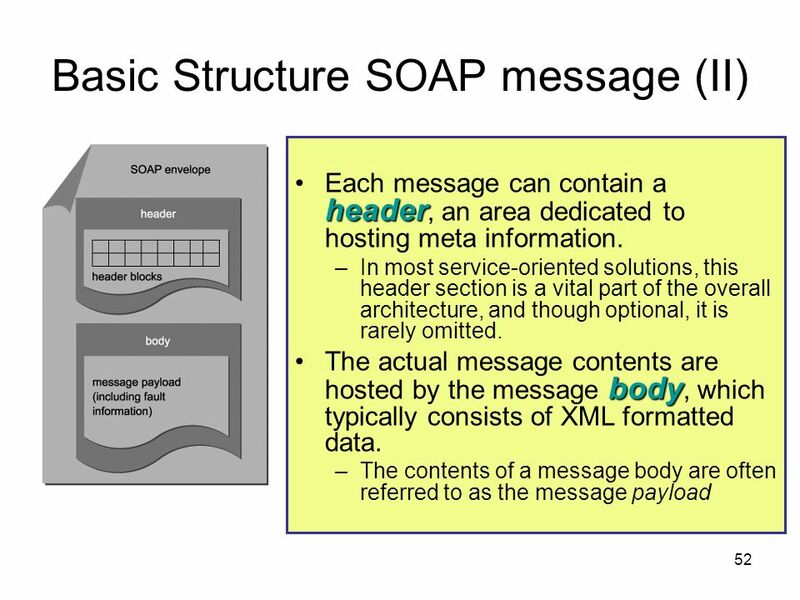 SOAP messaging establishes a standard message structure that includes an extensible header section used by numerous WS-* extensions to implement enterprise-level features. 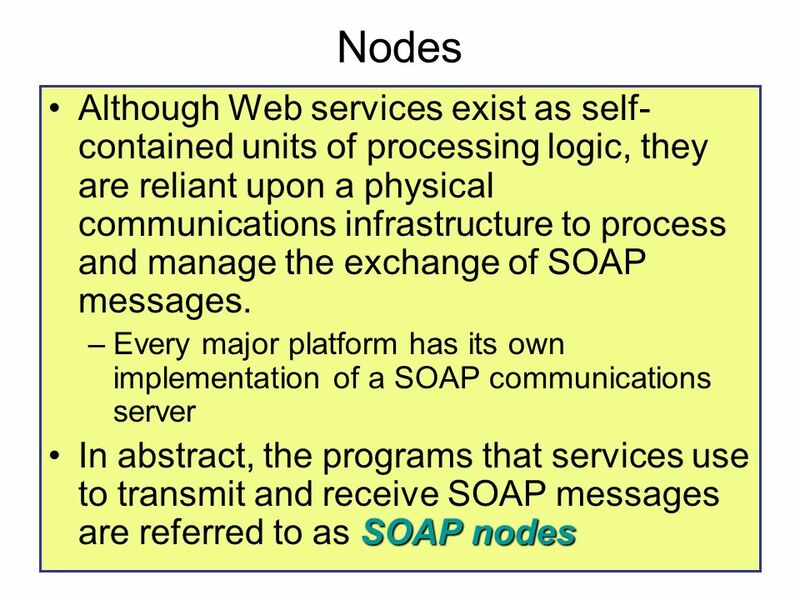 The SOAP node view of the Web services framework abstracts the physical communications framework, which consists of a series of SOAP servers. 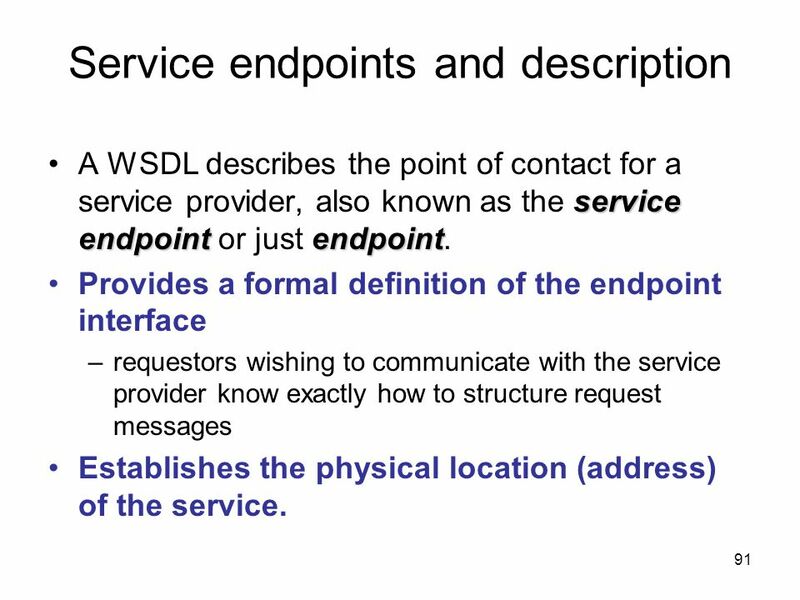 A WSDL describes the point of contact for a service provider, also known as the service endpoint or just endpoint. 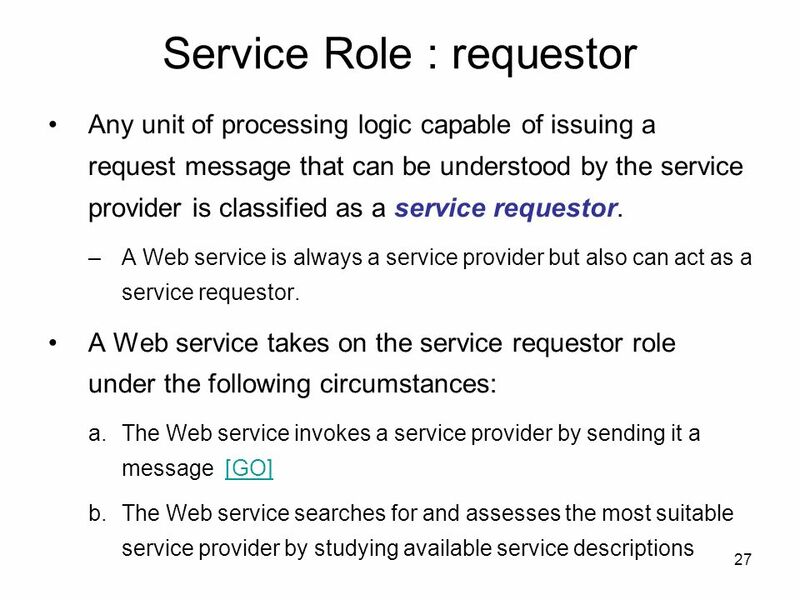 Provides a formal definition of the endpoint interface requestors wishing to communicate with the service provider know exactly how to structure request messages Establishes the physical location (address) of the service. 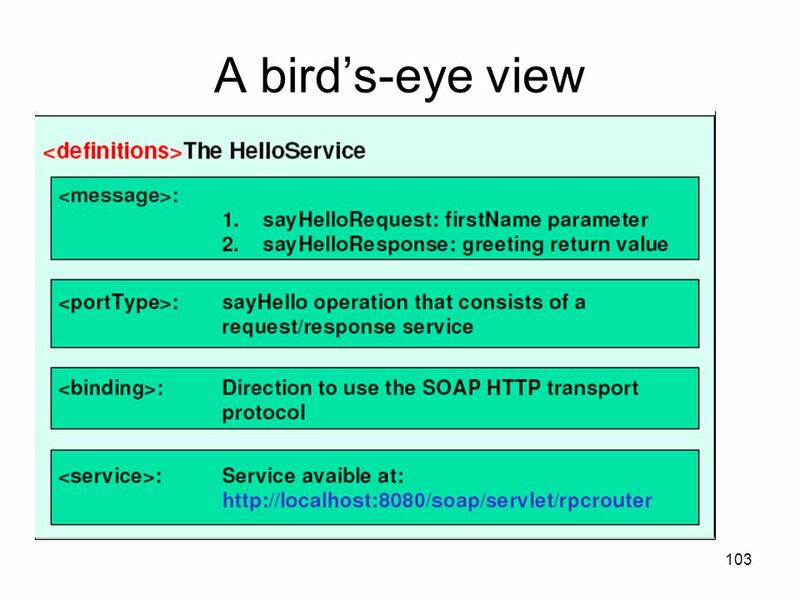 portType section provides a high-level view of the service interface. 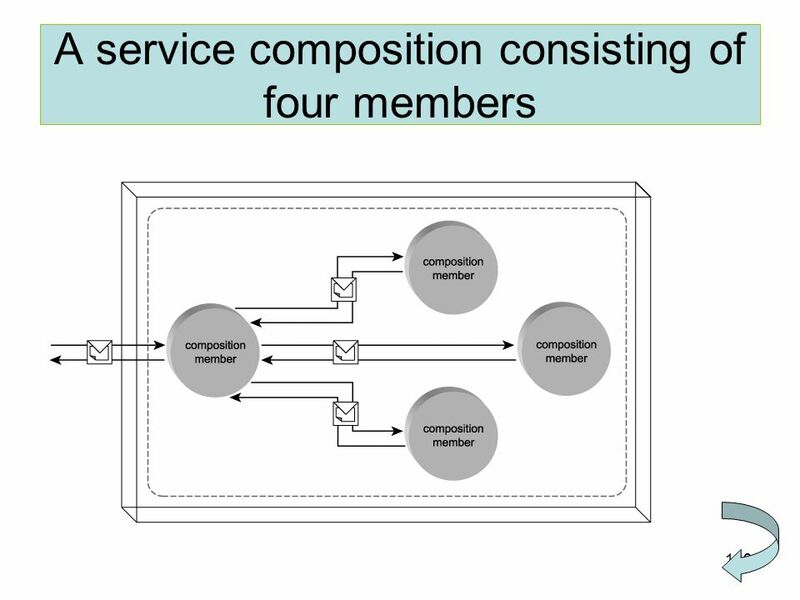 Each operation represents a specific action performed by the service. 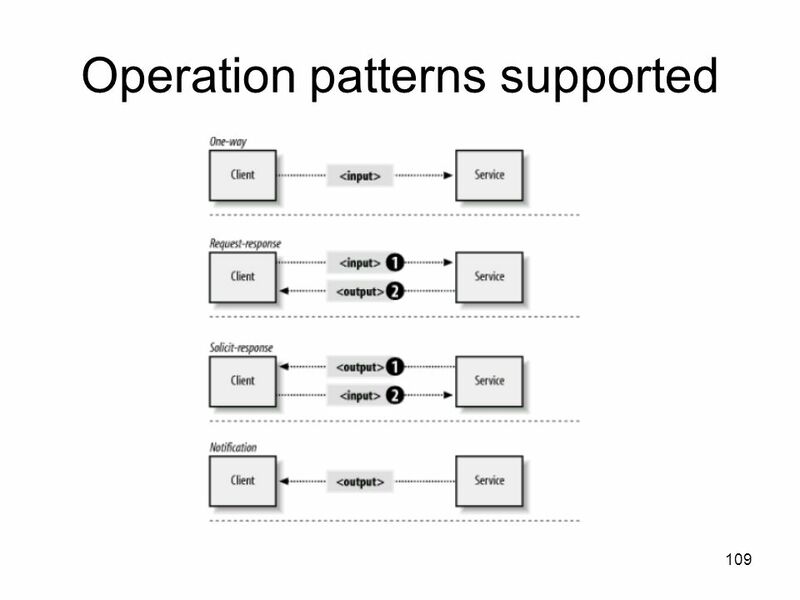 An operation consists of a set of input and output messages. 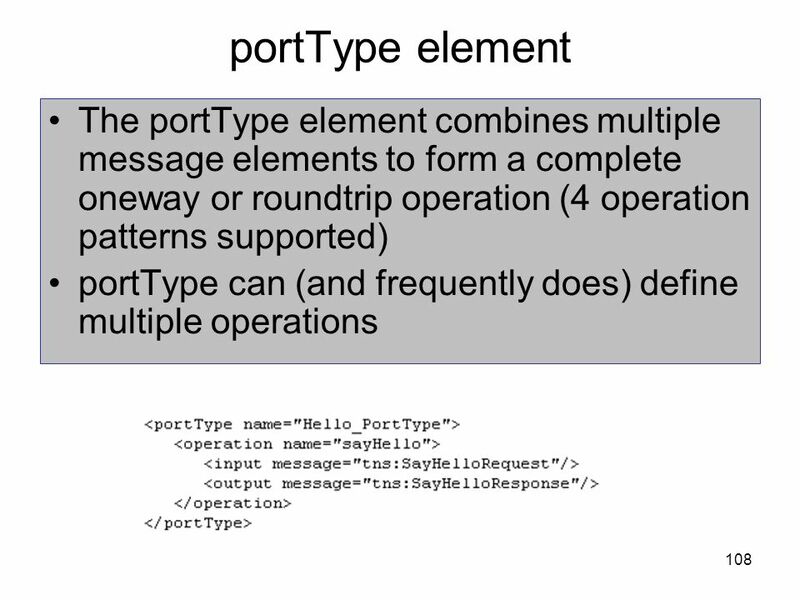 Much like component methods, operations also have input and output parameters. 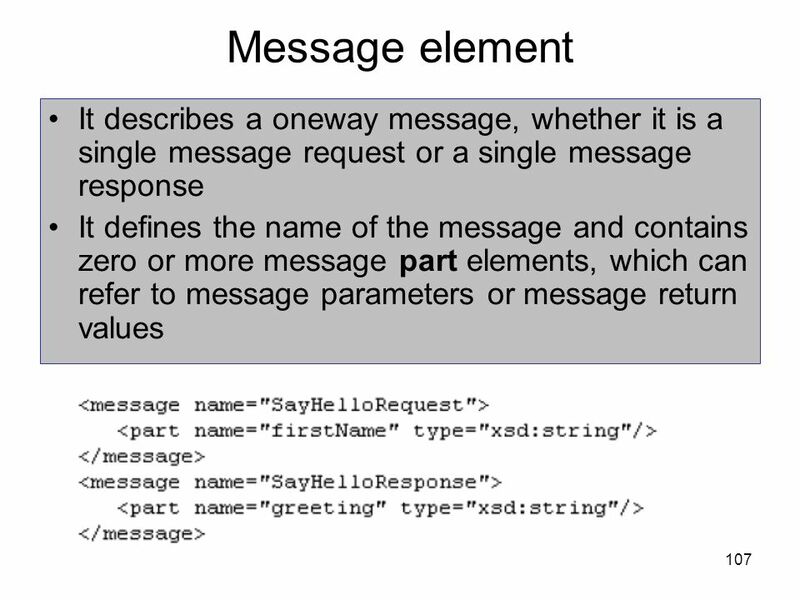 Because Web services rely exclusively on messaging-based communication, parameters are represented as messages. 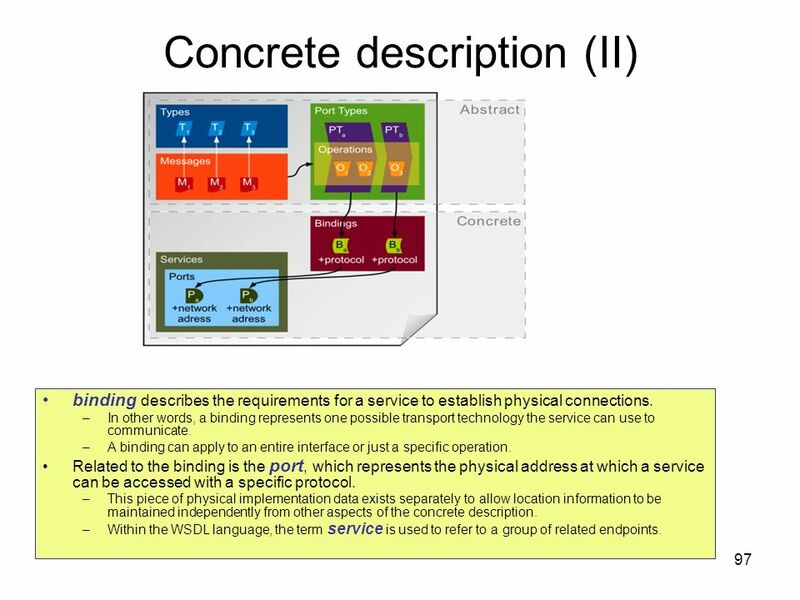 binding describes the requirements for a service to establish physical connections. 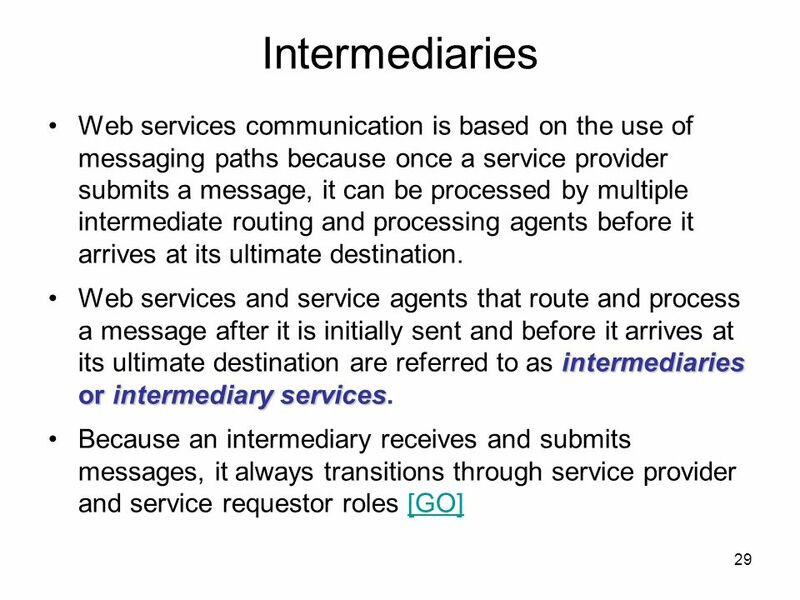 In other words, a binding represents one possible transport technology the service can use to communicate. 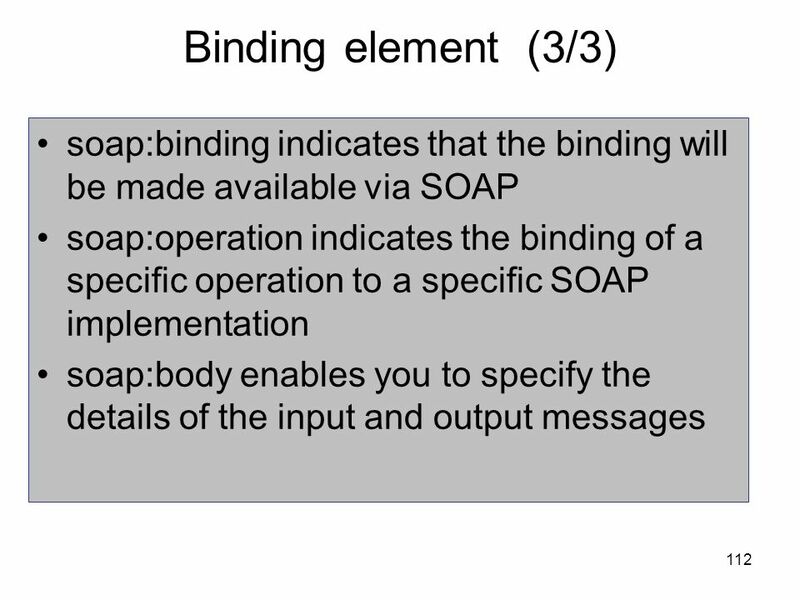 A binding can apply to an entire interface or just a specific operation. 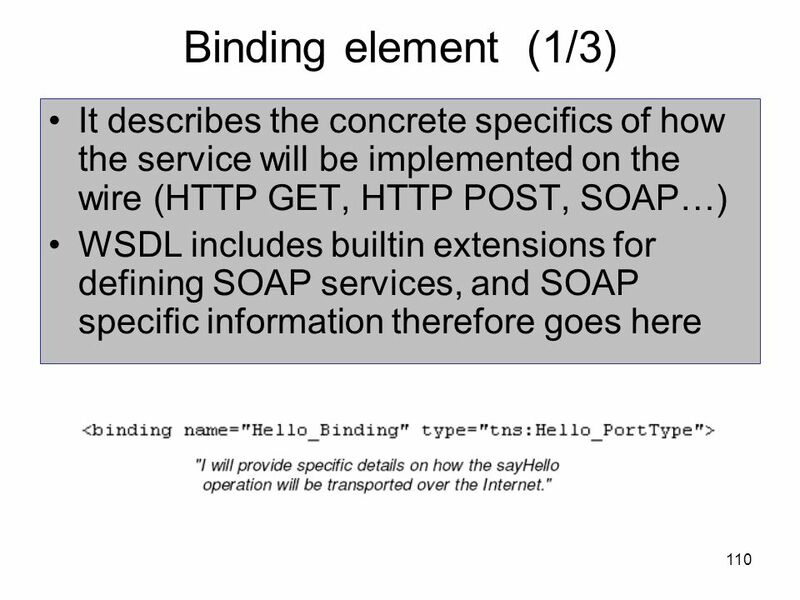 Related to the binding is the port, which represents the physical address at which a service can be accessed with a specific protocol. 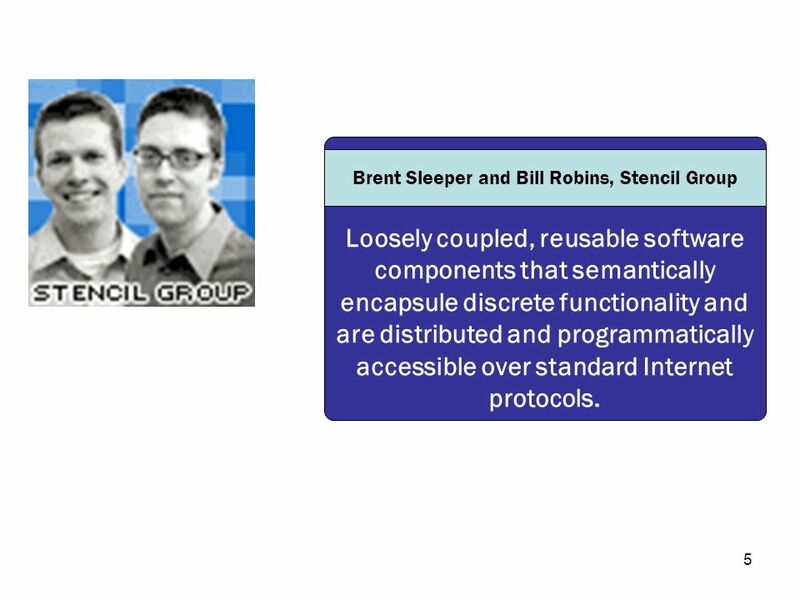 This piece of physical implementation data exists separately to allow location information to be maintained independently from other aspects of the concrete description. 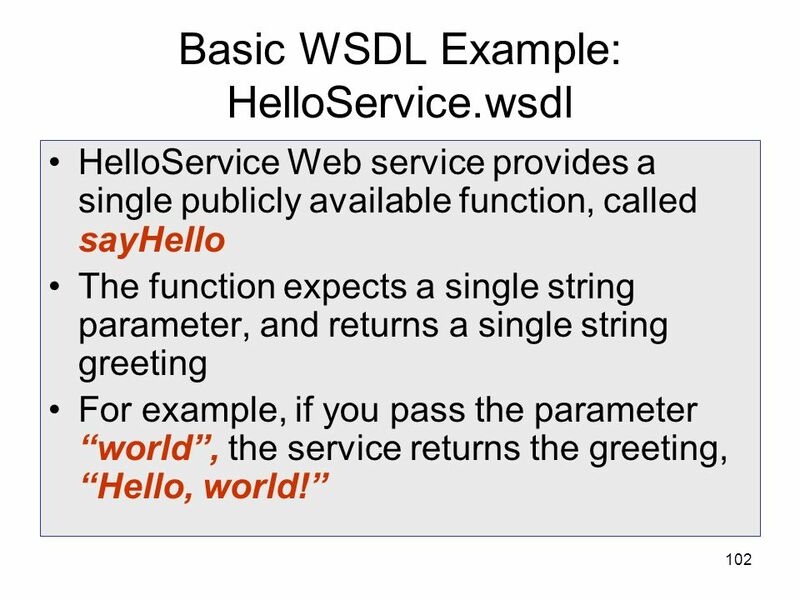 Within the WSDL language, the term service is used to refer to a group of related endpoints. 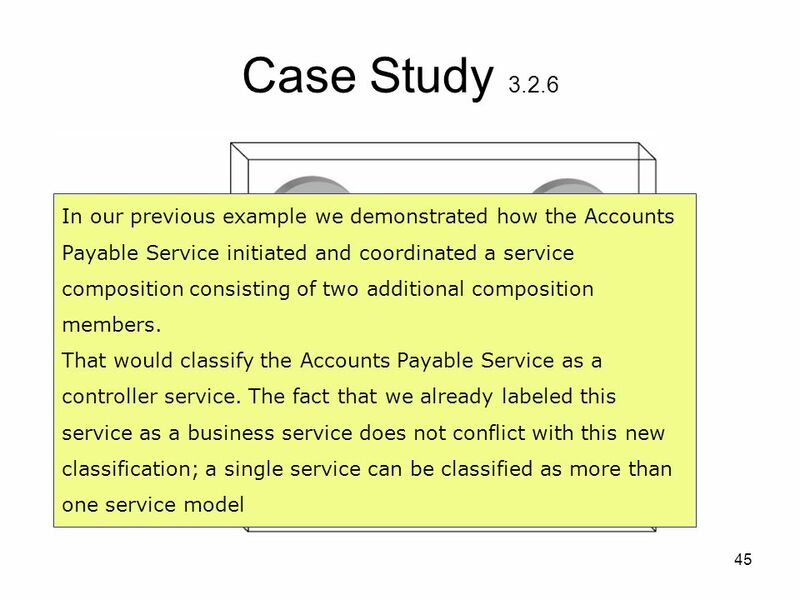 98 Case Study 3.3.2 The TLS Accounts Payable Service was created to receive invoices submitted by numerous vendors. 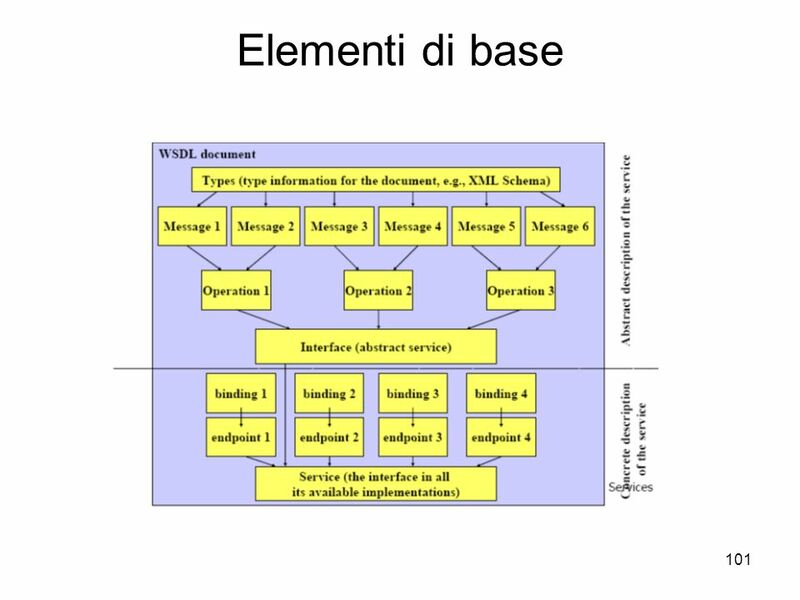 Its associated service description therefore has a simple abstract description consisting of one interface definition that contains a single operation called SubmitInvoice. 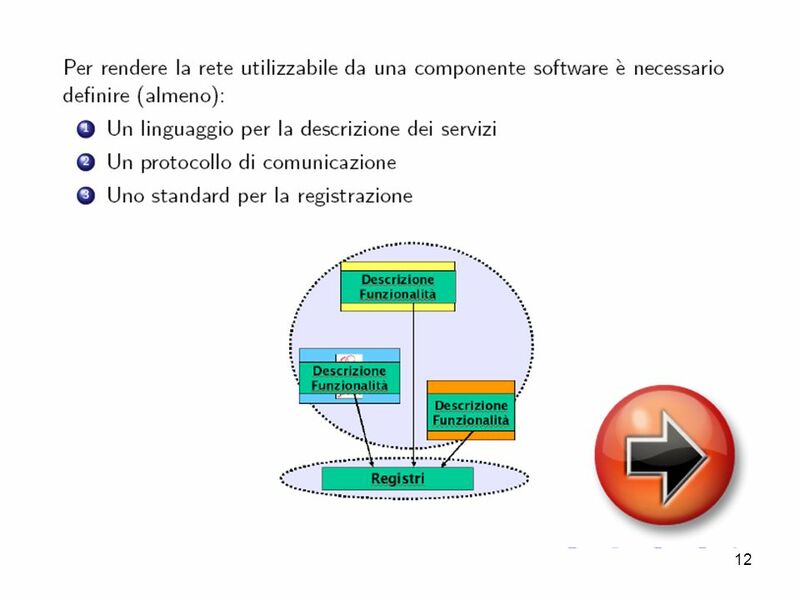 Specified within the operation is one input and one output message. 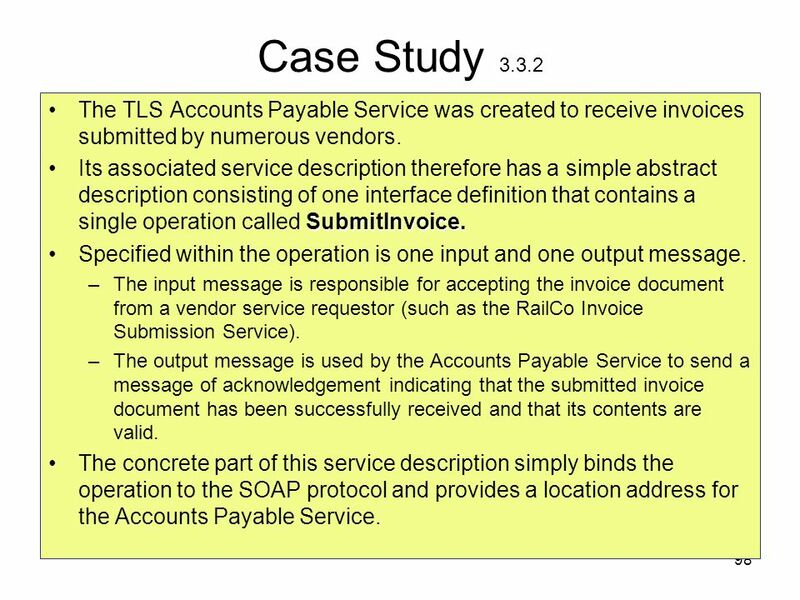 The input message is responsible for accepting the invoice document from a vendor service requestor (such as the RailCo Invoice Submission Service). 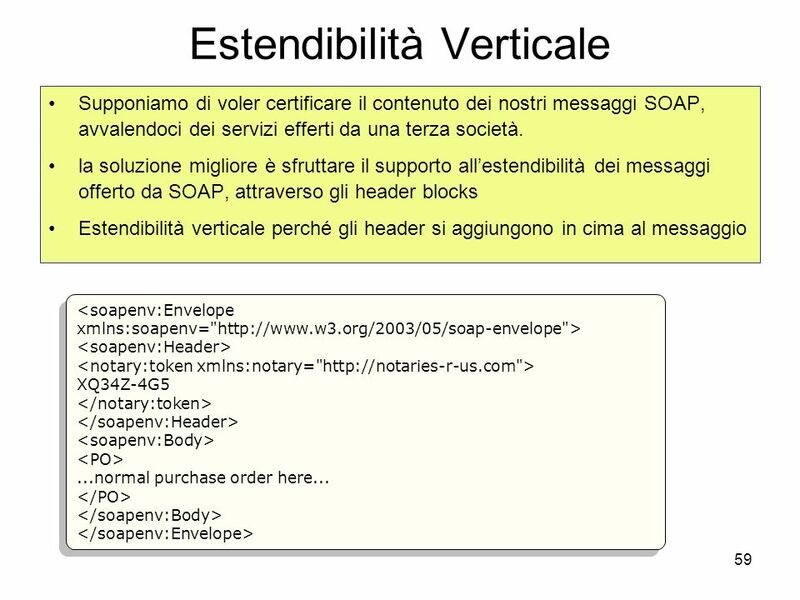 The output message is used by the Accounts Payable Service to send a message of acknowledgement indicating that the submitted invoice document has been successfully received and that its contents are valid. 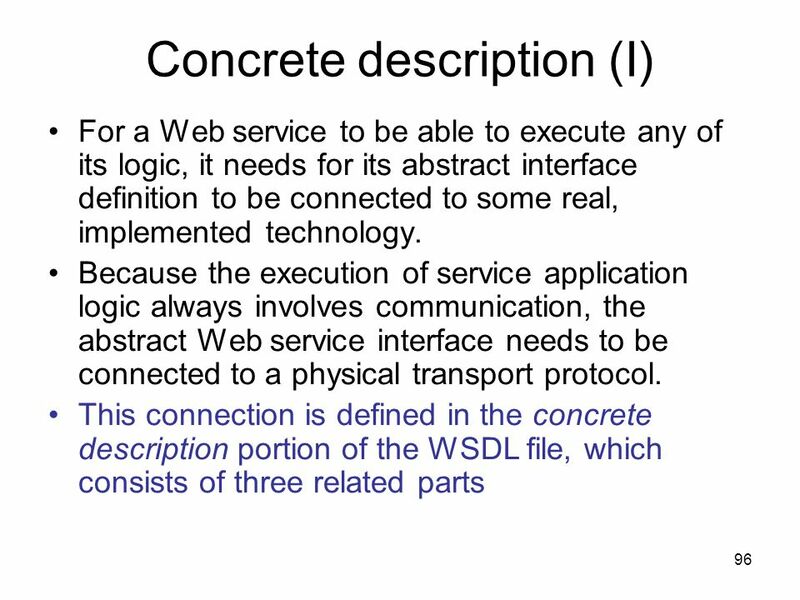 The concrete part of this service description simply binds the operation to the SOAP protocol and provides a location address for the Accounts Payable Service. 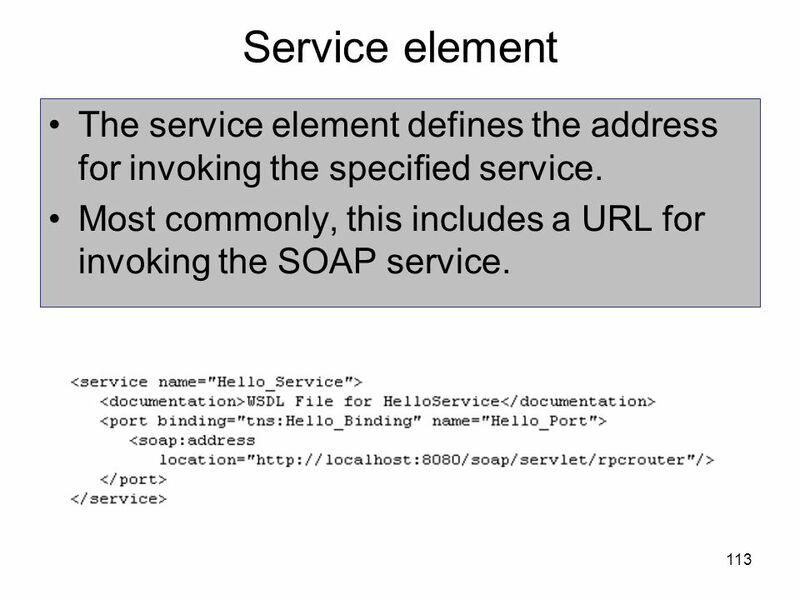 113 Service element The service element defines the address for invoking the specified service. 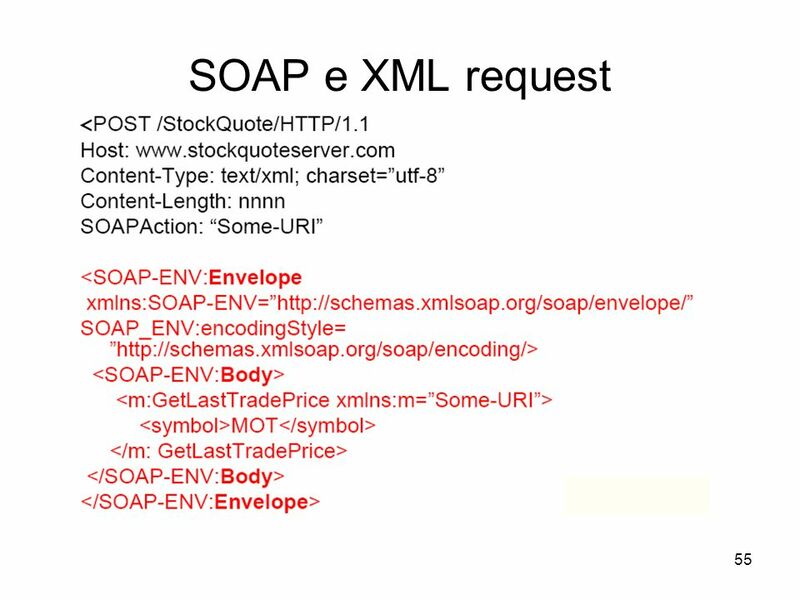 Most commonly, this includes a URL for invoking the SOAP service. 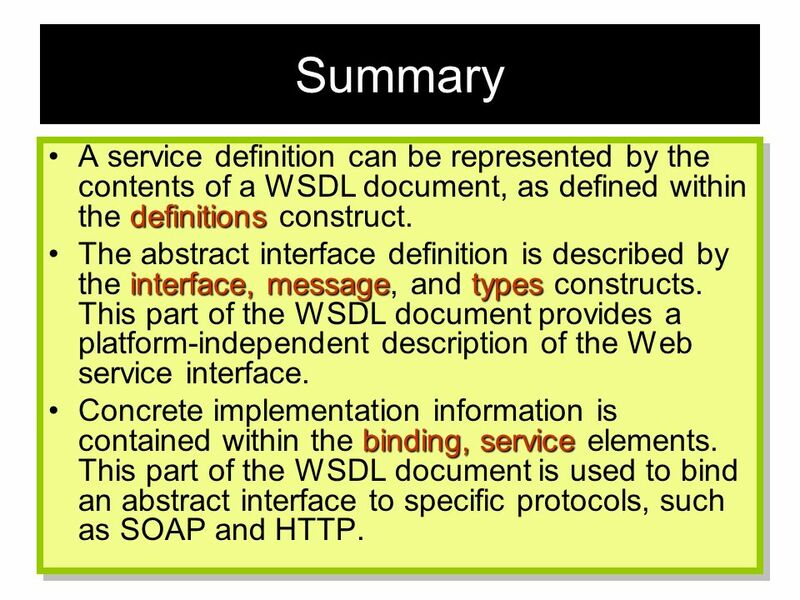 114 Summary A service definition can be represented by the contents of a WSDL document, as defined within the definitions construct. 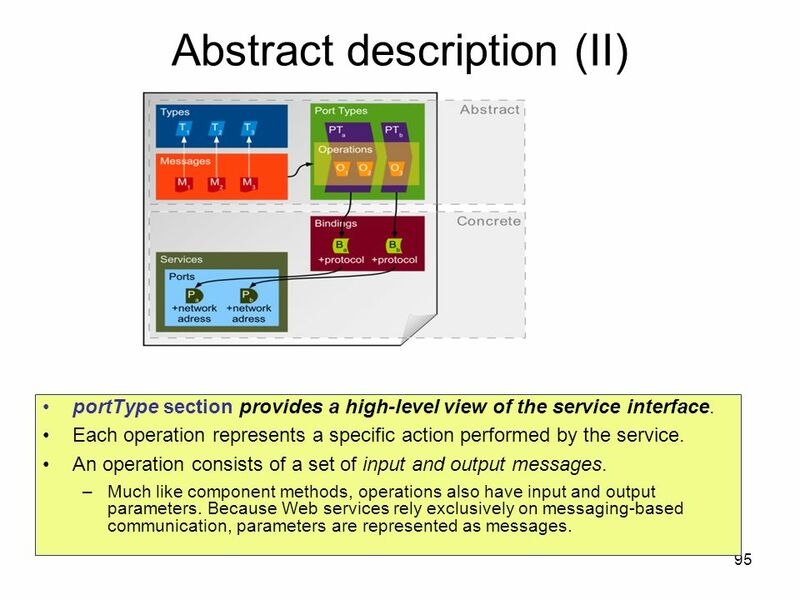 The abstract interface definition is described by the interface, message, and types constructs. 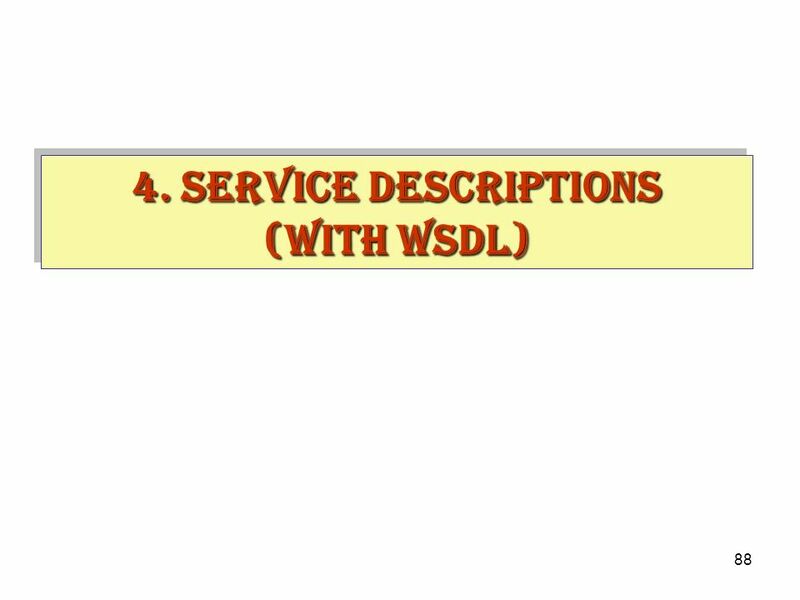 This part of the WSDL document provides a platform-independent description of the Web service interface. 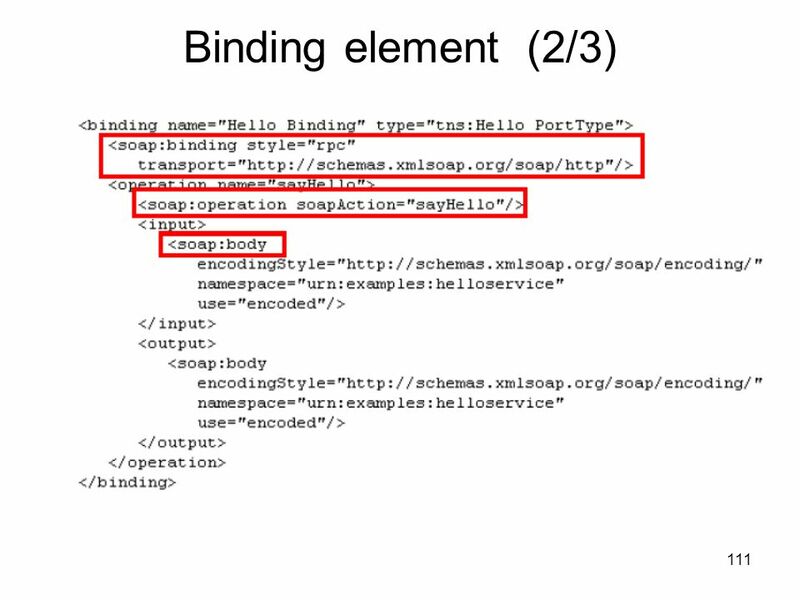 Concrete implementation information is contained within the binding, service elements. 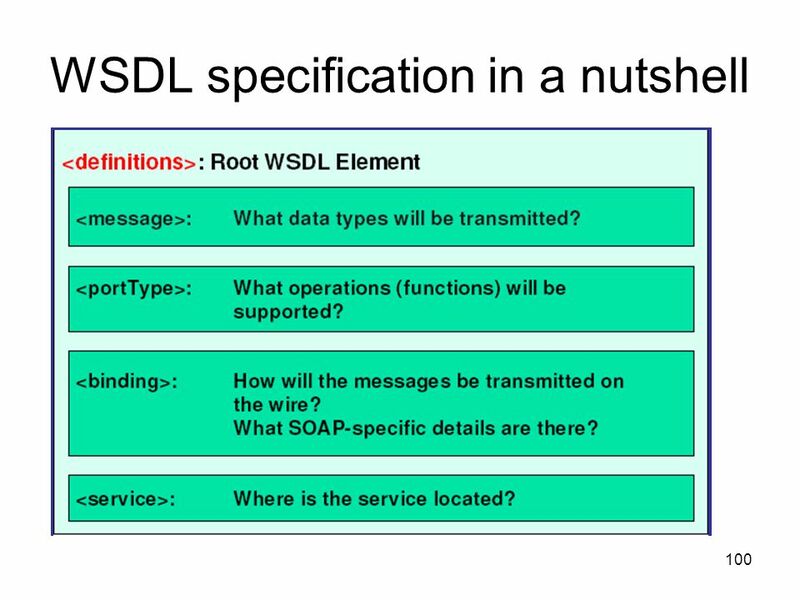 This part of the WSDL document is used to bind an abstract interface to specific protocols, such as SOAP and HTTP. 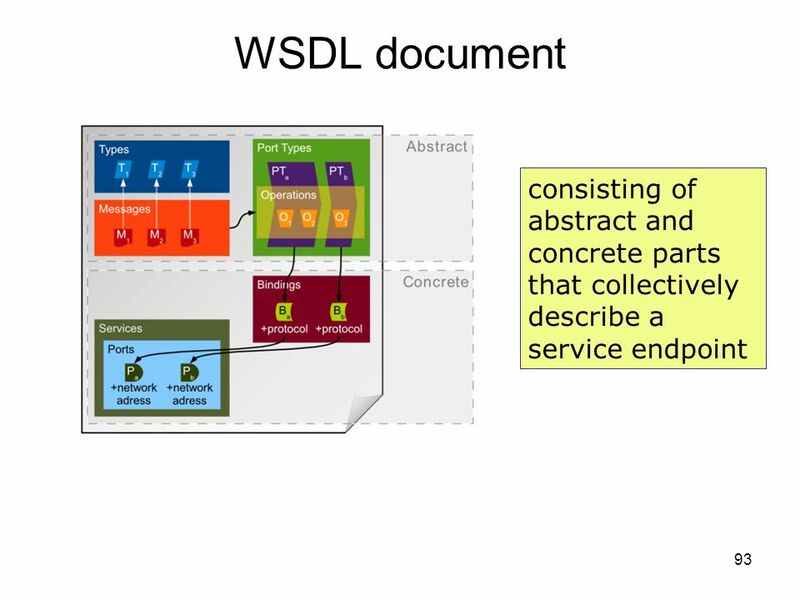 115 Metadata We have up to three separate documents that each describe an aspect of a service: WSDL definition XSD schema Policy Each of these three service description documents can be classified as service metadata, as each provides information about the service. 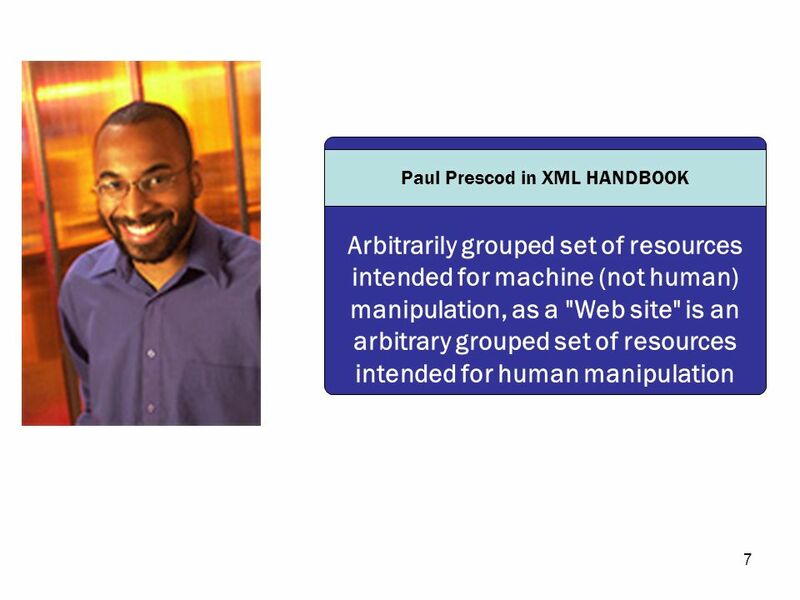 These registries can be searched manually and accessed programmatically via a standardized API. 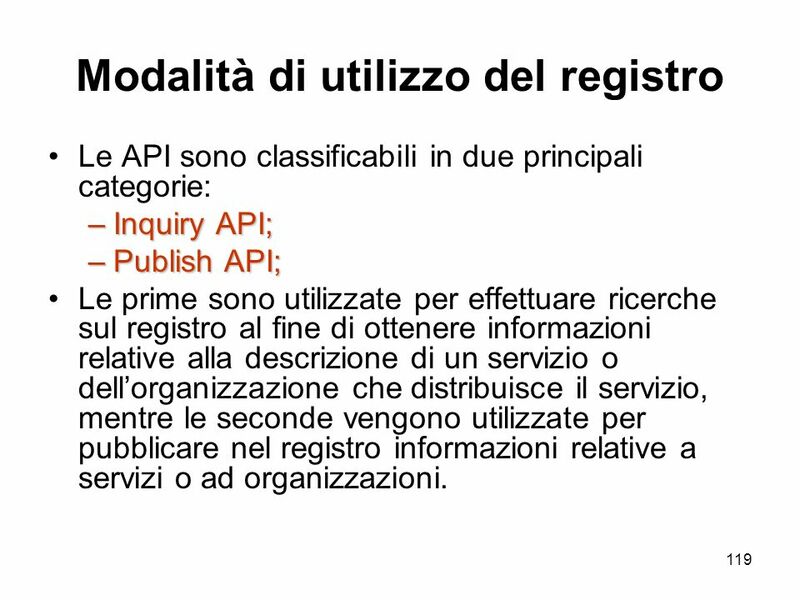 Le API sono classificabili in due principali categorie: Inquiry API; Publish API; Le prime sono utilizzate per effettuare ricerche sul registro al fine di ottenere informazioni relative alla descrizione di un servizio o dell’organizzazione che distribuisce il servizio, mentre le seconde vengono utilizzate per pubblicare nel registro informazioni relative a servizi o ad organizzazioni. 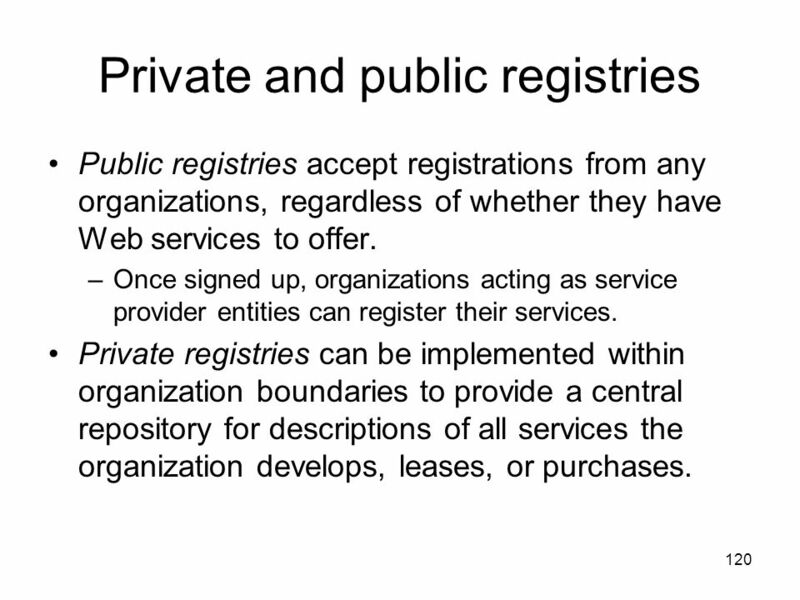 Public registries accept registrations from any organizations, regardless of whether they have Web services to offer. 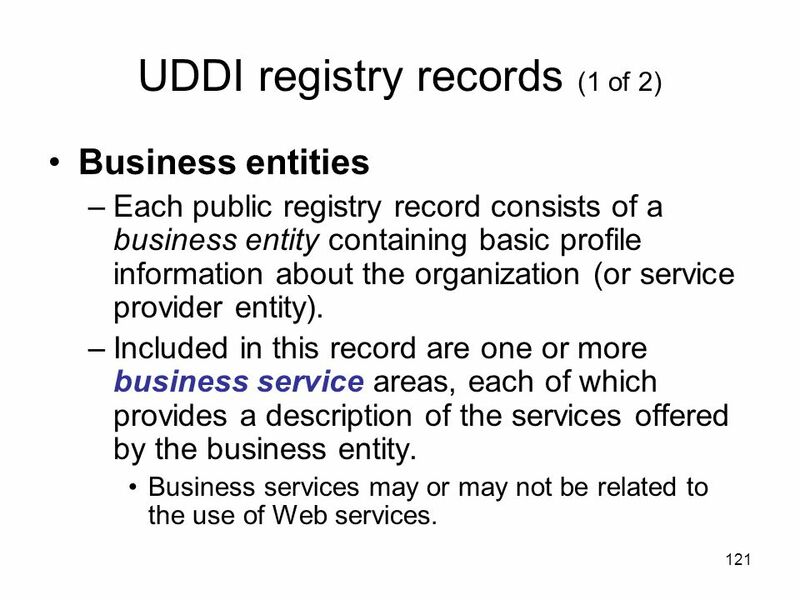 Once signed up, organizations acting as service provider entities can register their services. 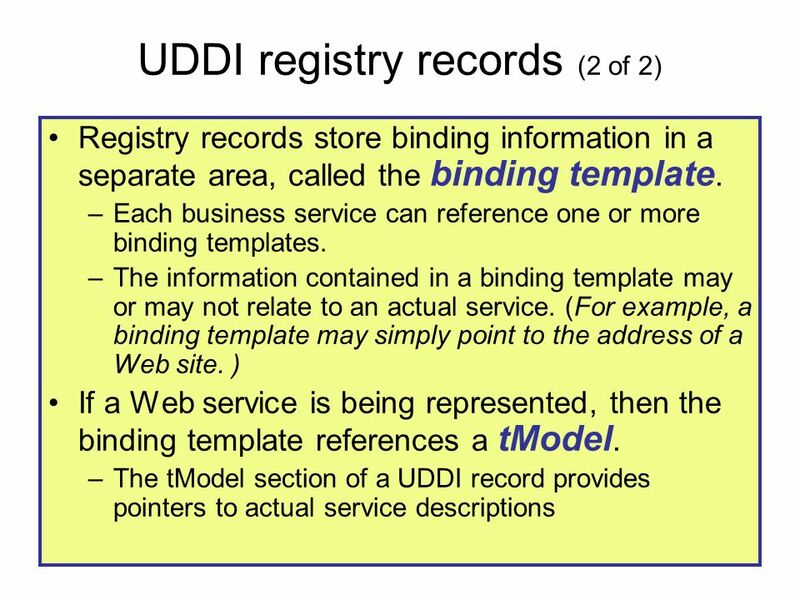 Private registries can be implemented within organization boundaries to provide a central repository for descriptions of all services the organization develops, leases, or purchases. 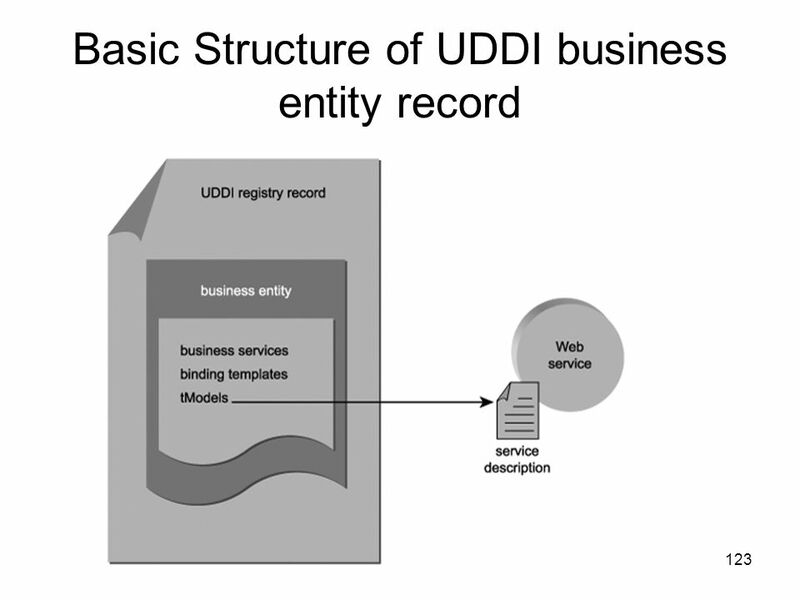 Business entities Each public registry record consists of a business entity containing basic profile information about the organization (or service provider entity). 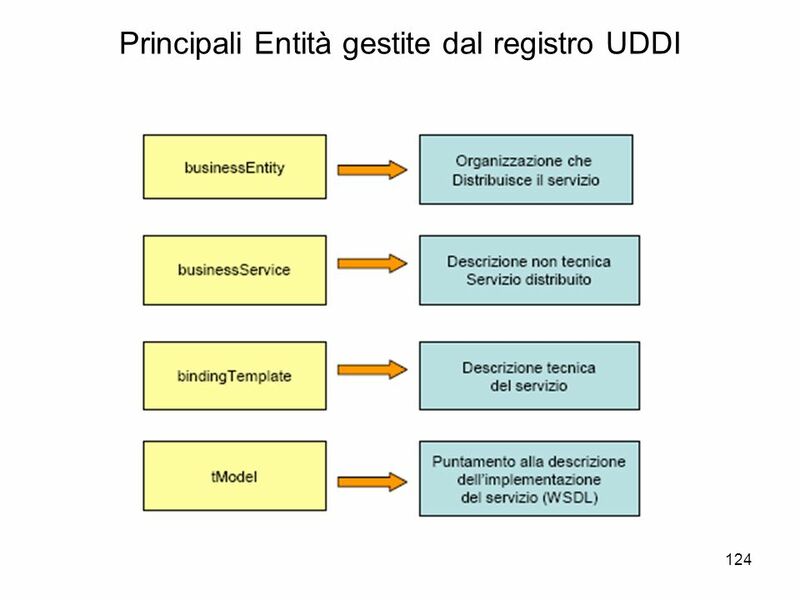 Included in this record are one or more business service areas, each of which provides a description of the services offered by the business entity. 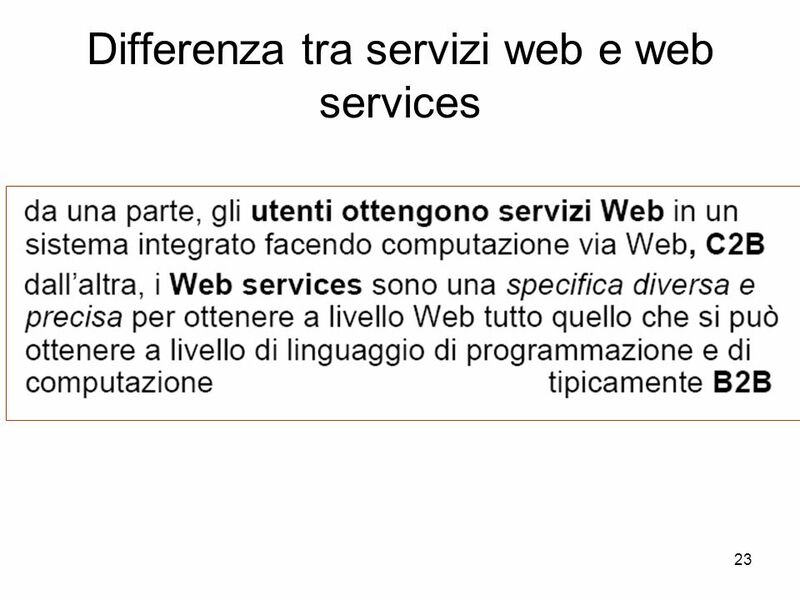 Business services may or may not be related to the use of Web services. 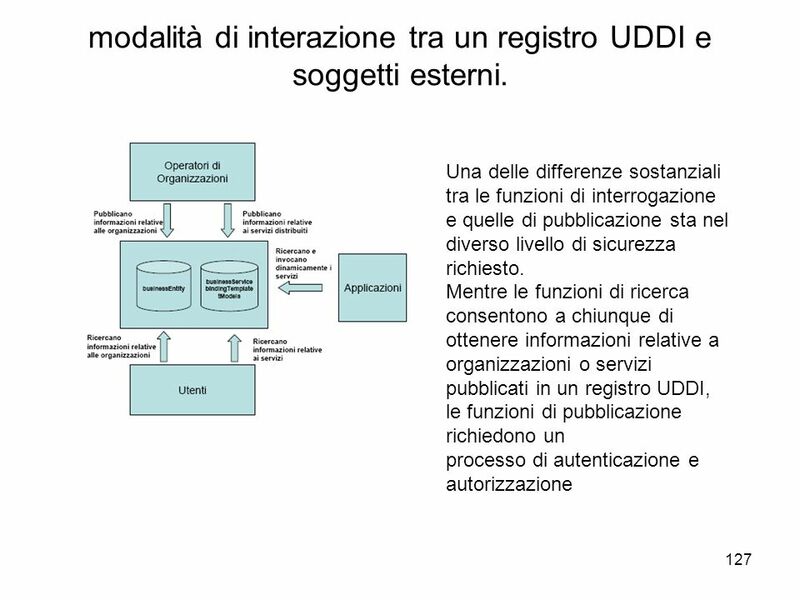 127 modalità di interazione tra un registro UDDI e soggetti esterni. 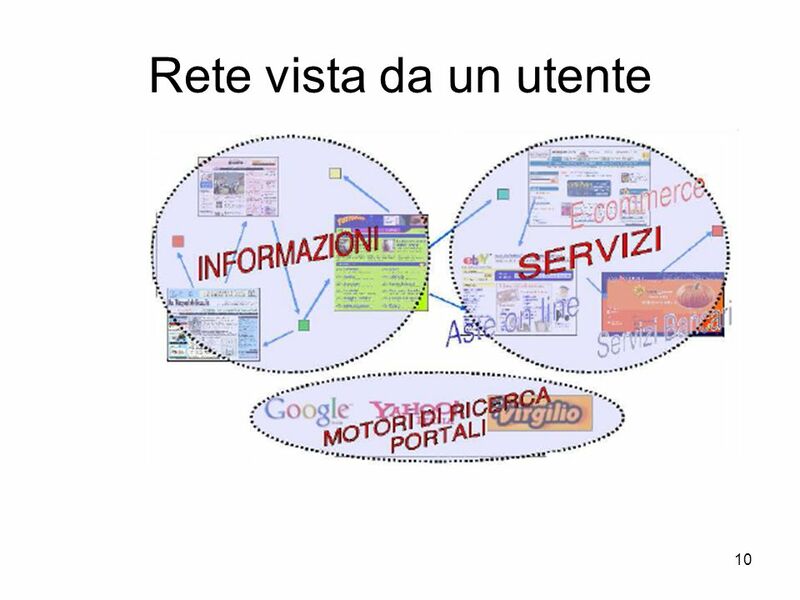 White Pages, contengono le informazioni anagrafiche di una organizzazione, quale il nome, l’indirizzo, il numero di telefono oltre ad identificativi del settore Yellow Pages, contengono le informazioni sui vari servizi messi a disposizione dalle organizzazioni; Green Pages, contengono le informazioni tecniche sul servizio Web e possono includere anche la descrizione tecnica del servizio (WSDL). 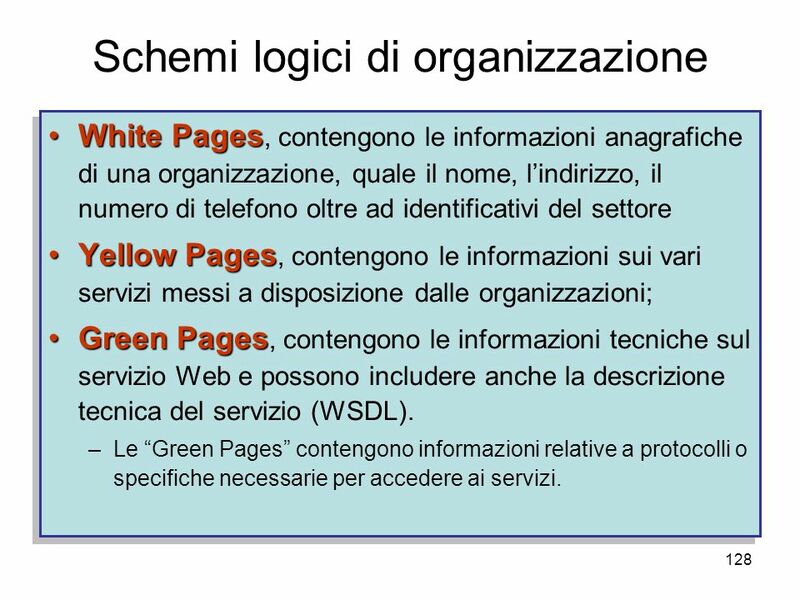 Le “Green Pages” contengono informazioni relative a protocolli o specifiche necessarie per accedere ai servizi. 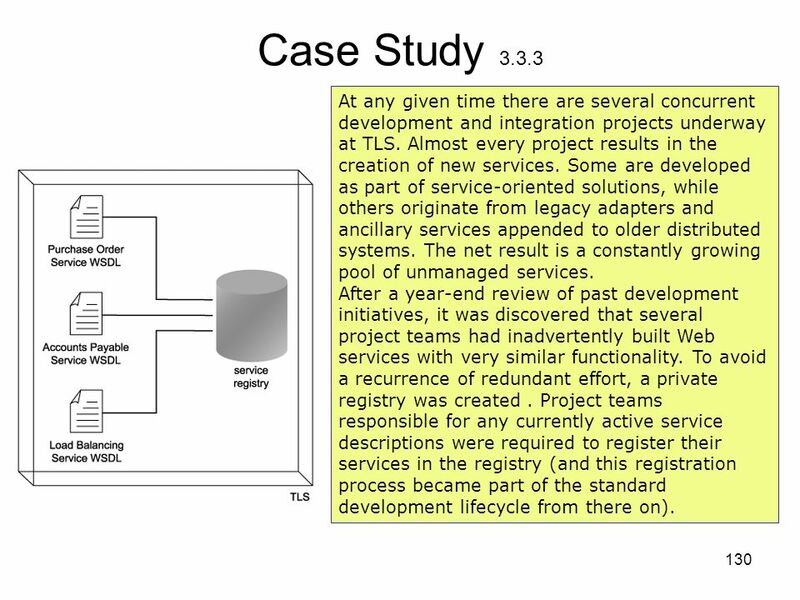 130 Case Study 3.3.3 At any given time there are several concurrent development and integration projects underway at TLS. 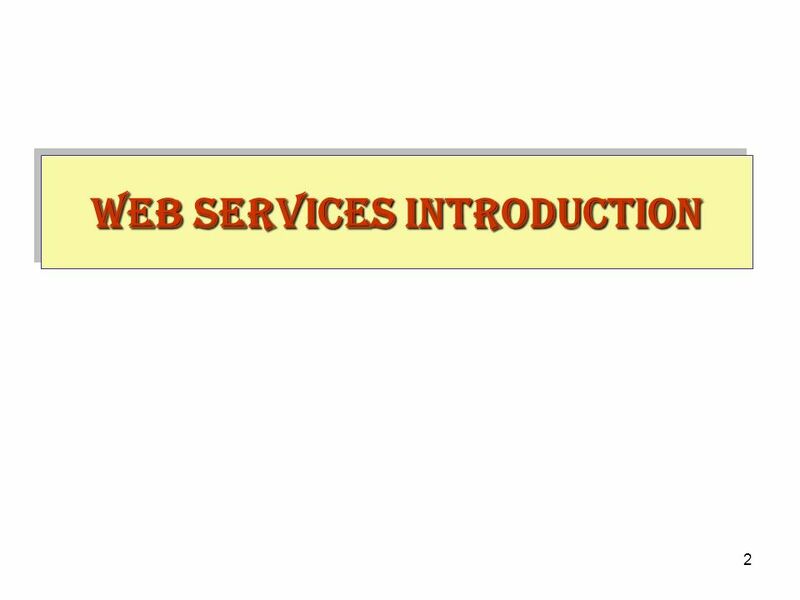 Almost every project results in the creation of new services. 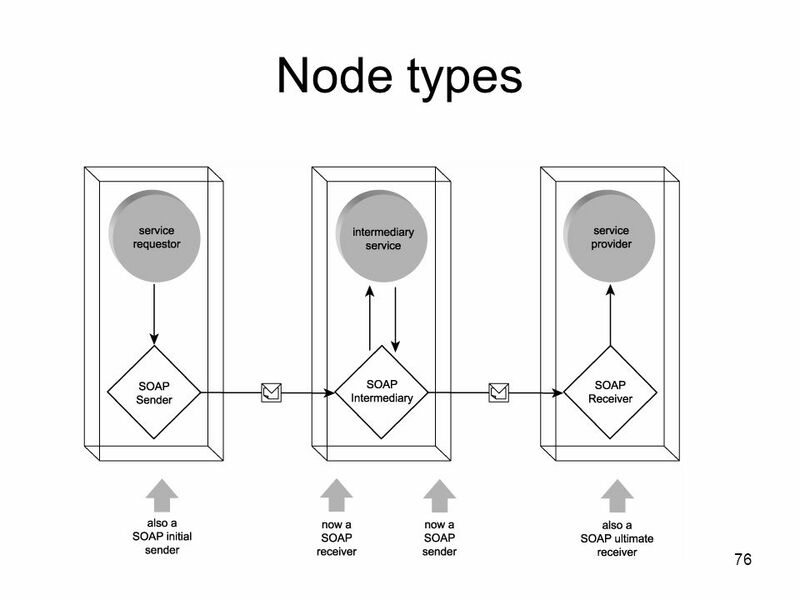 Some are developed as part of service-oriented solutions, while others originate from legacy adapters and ancillary services appended to older distributed systems. 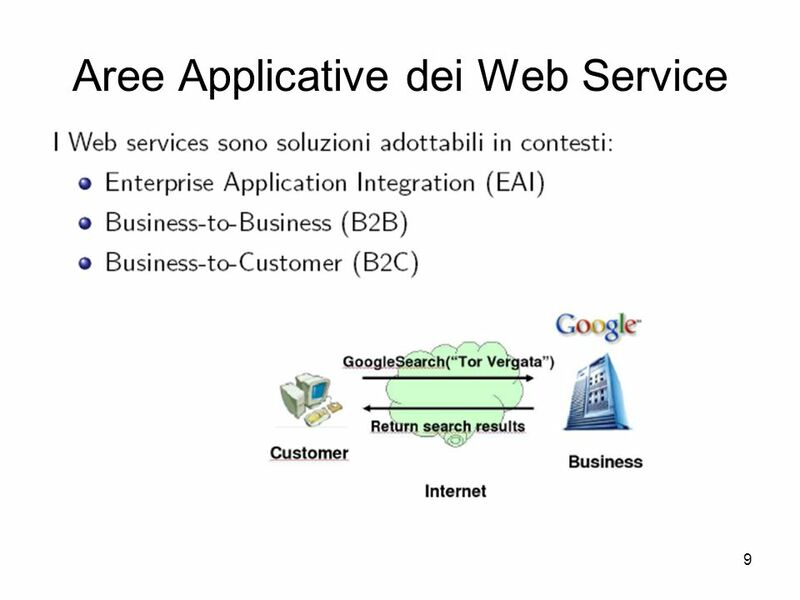 The net result is a constantly growing pool of unmanaged services. 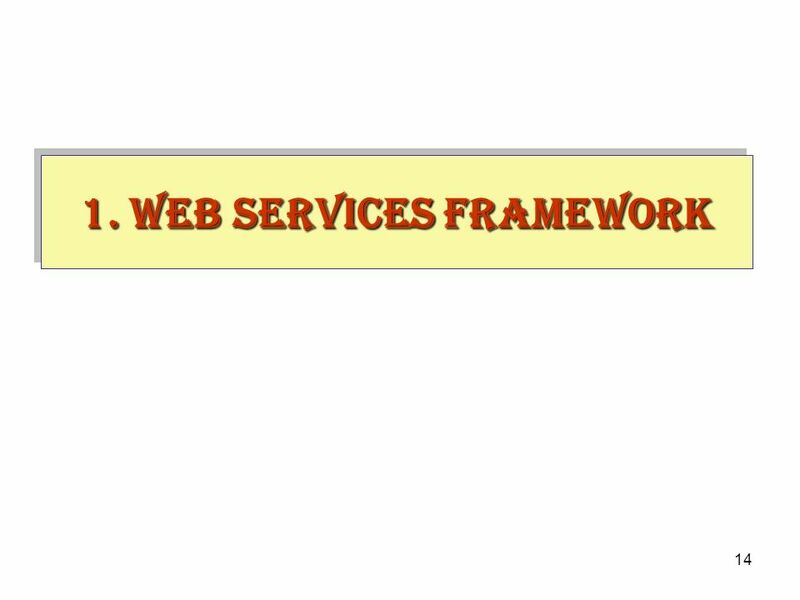 After a year-end review of past development initiatives, it was discovered that several project teams had inadvertently built Web services with very similar functionality. 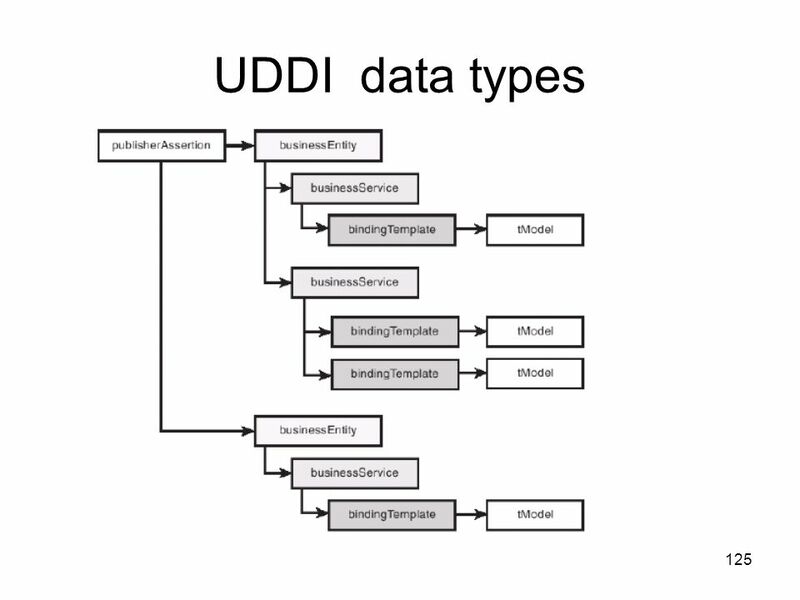 To avoid a recurrence of redundant effort, a private registry was created . 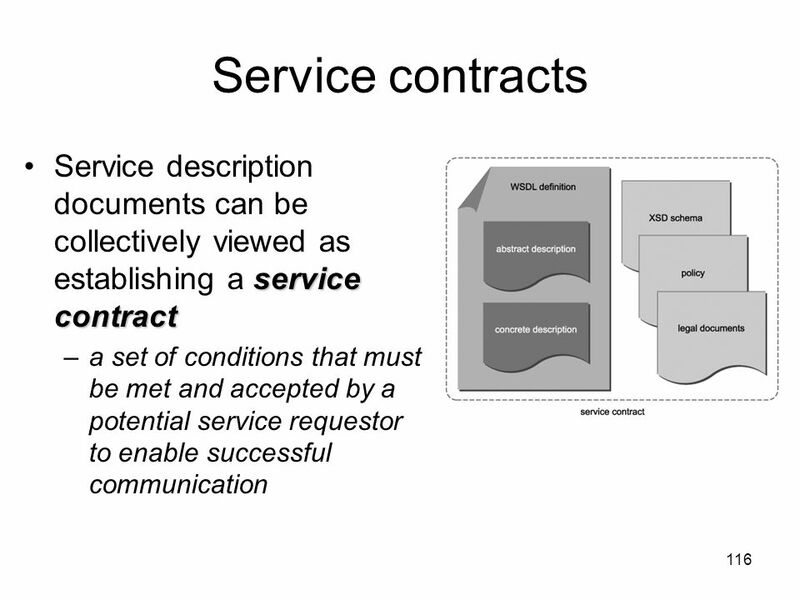 Project teams responsible for any currently active service descriptions were required to register their services in the registry (and this registration process became part of the standard development lifecycle from there on). 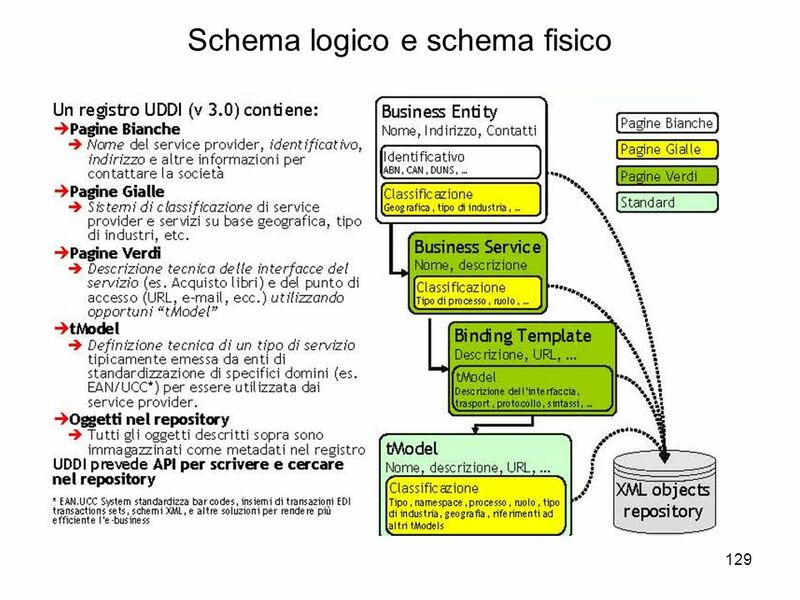 131 Punti chiave 3.4 The two other primary service description documents are XSD schemas and policies. 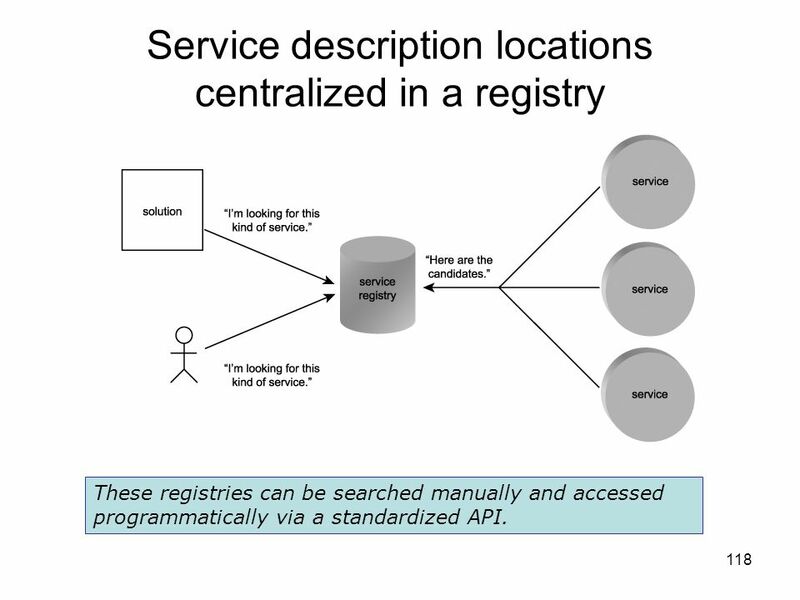 Service descriptions can be dynamically discovered by humans or applications, using private or public service registries. 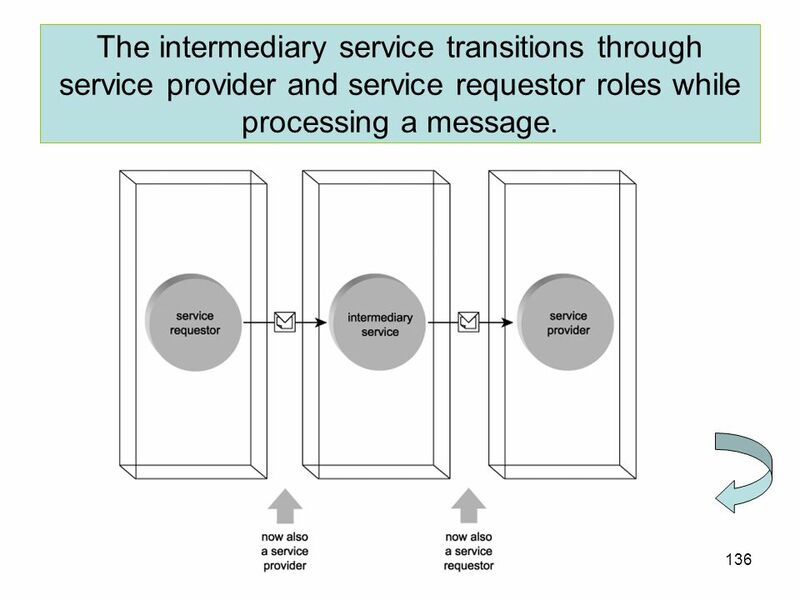 136 The intermediary service transitions through service provider and service requestor roles while processing a message. 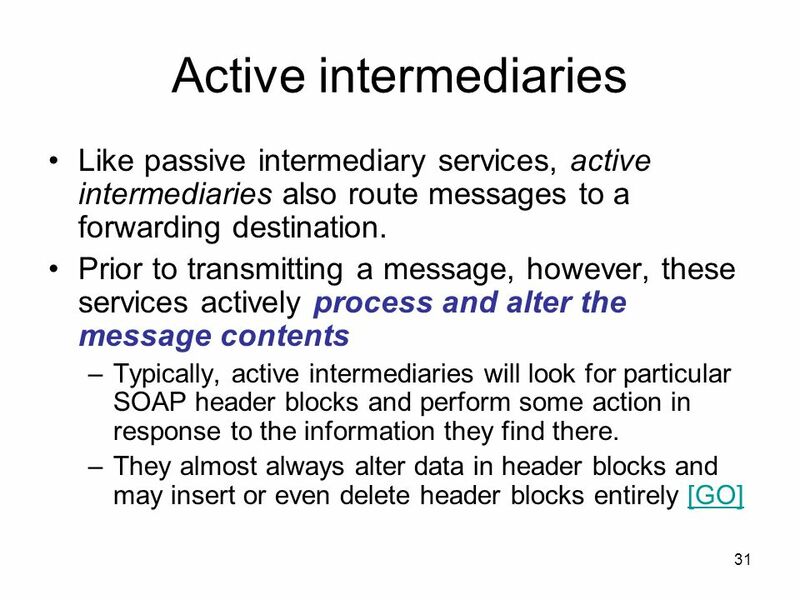 137 A passive intermediary service processing a message without altering its contents. 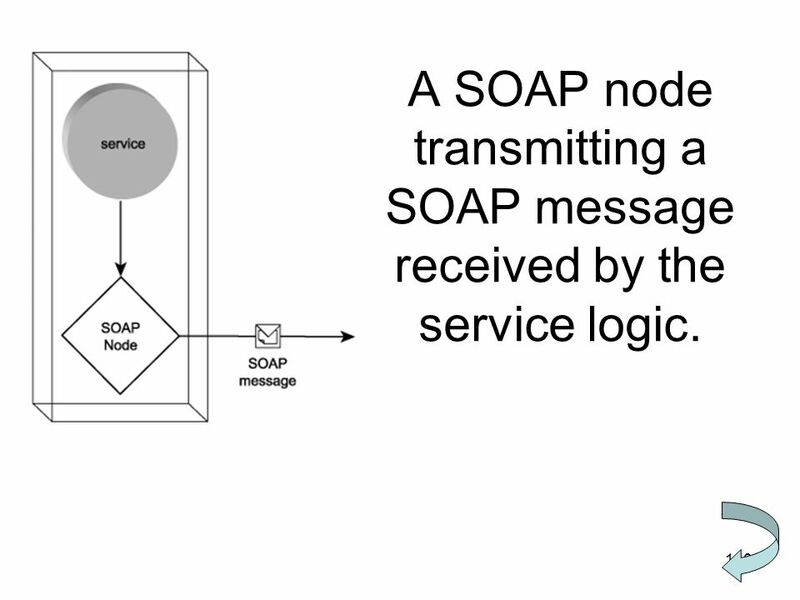 140 A SOAP node transmitting a SOAP message received by the service logic. 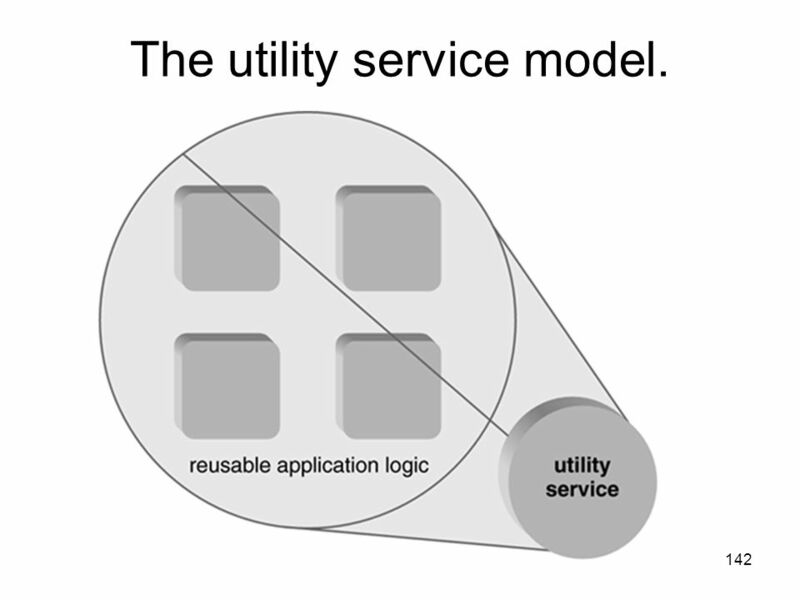 142 The utility service model. 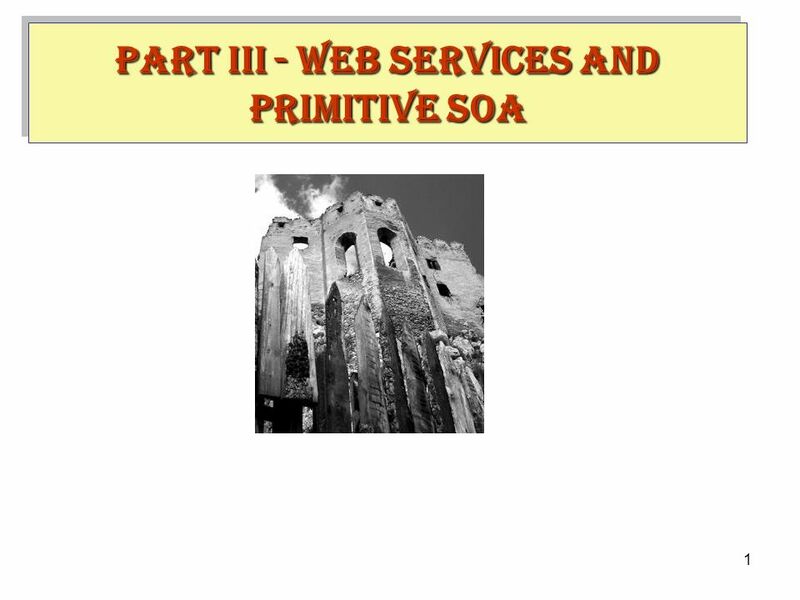 Download ppt "PART III - WEB SERVICES AND PRIMITIVE SOA"